It’s time for the annual vacation, which this year is also the biennial Budge family reunion with my mother, siblings, and offspring, in Logan, Utah; and also my annual geology trek with Bruce Rabe, retired paleontologist. gentleman, and scholar, in western Colorado. I had packed the previous evening, Sunday, July 22, except for the perishable items, and am up before dawn to finish packing and head out. Earlier than I had planned, actually; I had trouble staying asleep. Must be the anticipation. I’m out the door just as the sun is rising. I head west past Bandelier towards the Pajarito fault escarpment. 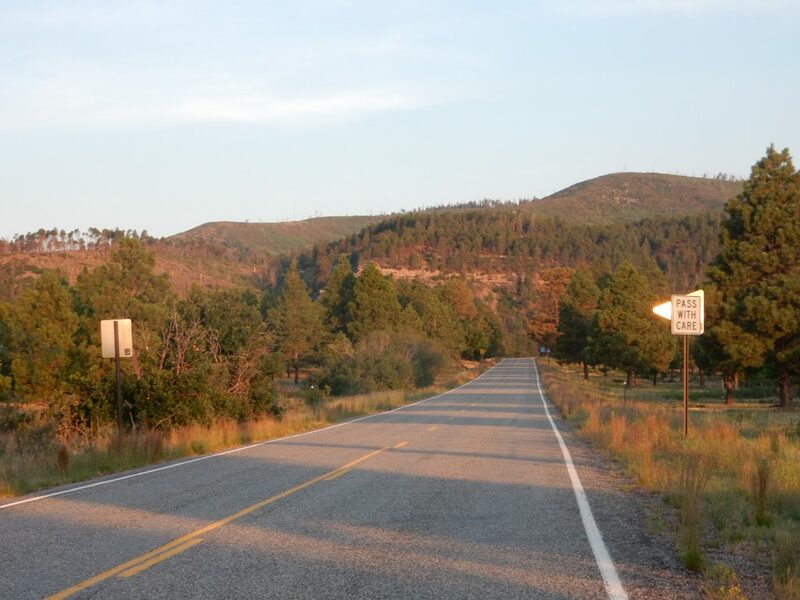 The Pajarito Fault is the most important fault of the Rio Grande Rift in the Los Alamos area. 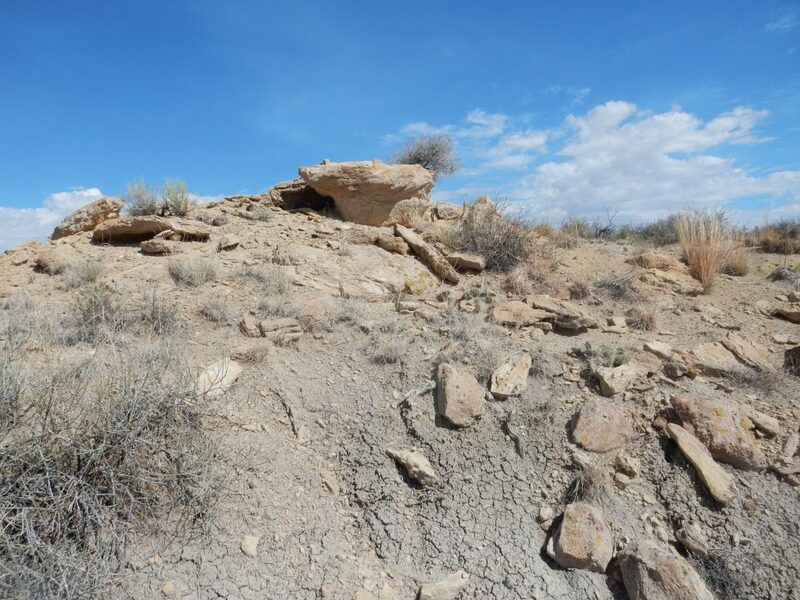 It has been active for at least the last 1.25 million years, displacing the Bandelier Tuff of that age making up the escarpment here. It’s been estimated the fault is capable of generating earthquakes of better than magnitude six, but only at intervals of several thousands of years. You can see the road winding up the face of the escarpment. Yes, this is familiar ground; I’m just warming up my camera and my monologue. There is a small fire burning between South Mountain, at far left on the skyline, and the Redondo dome to its right. The Park Service (which now runs the Valles preserve) has decided that since it is lightning-caused, and has limited potential for spread, they will let it burn out on its own. 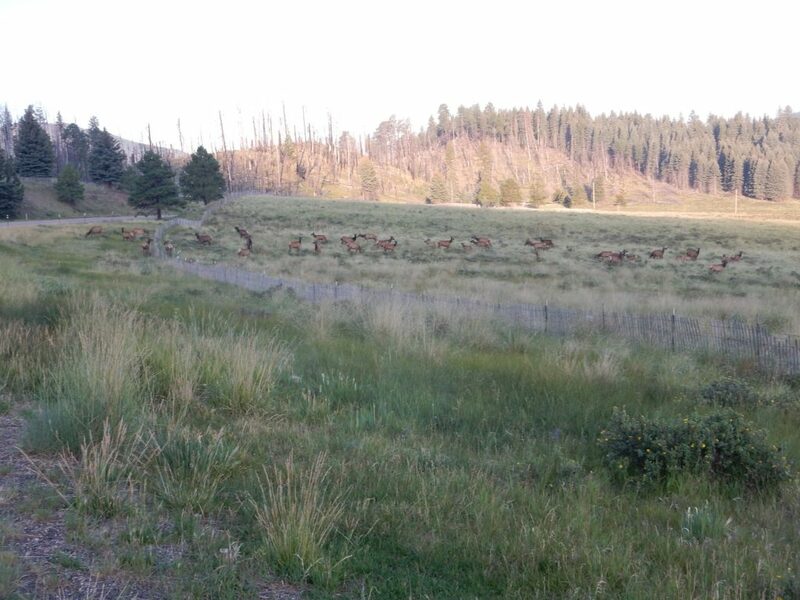 Wildfire is a natural part of the ecosystem here. Other features in this panorama are Redondito, the small peak to the right of the main Redondo Peak; Cerros del Abrigo and Cerro del Medio to the right; and the Valle Grande in the foreground. The Valle Grande is part of the floor of the Valles Caldera, formed 1.25 million years ago in a super-colossal* eruption that emplaced the Tsherige Member of the Bandelier Tuff that forms the upper part of the finger mesas around Los Alamos. The eruption created a caldera twelve miles across as the magma chamber beneath was emptied and its roof collapsed. Redondo Peak is the high point of a resurgent dome, formed shortly after the caldera eruption as fresh magma entered the magma chamber and pushed part of the caldera floor back up. South Mountain, Cerros del Abrigo, and Cerro del Medio are ring fracture domes, formed by eruption of fresh batches of magma through the ring fracture formed by the caldera collapse. 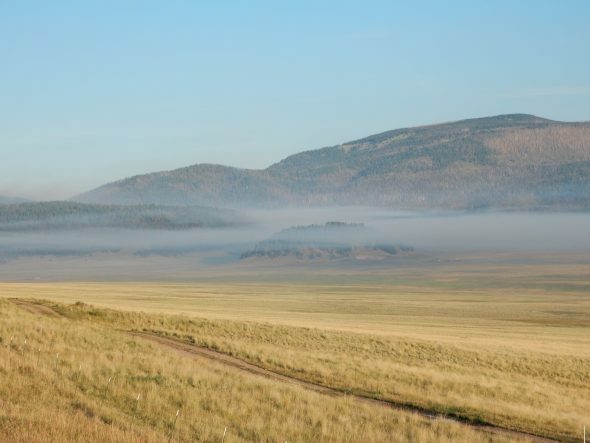 The Valles Caldera is a particularly good example of a geologically young caldera, and has been heavily studied by geologists. It is the type specimen of a resurgent caldera, first characterized by geologists R.L. Smith and R.A. Bailey in 1968. 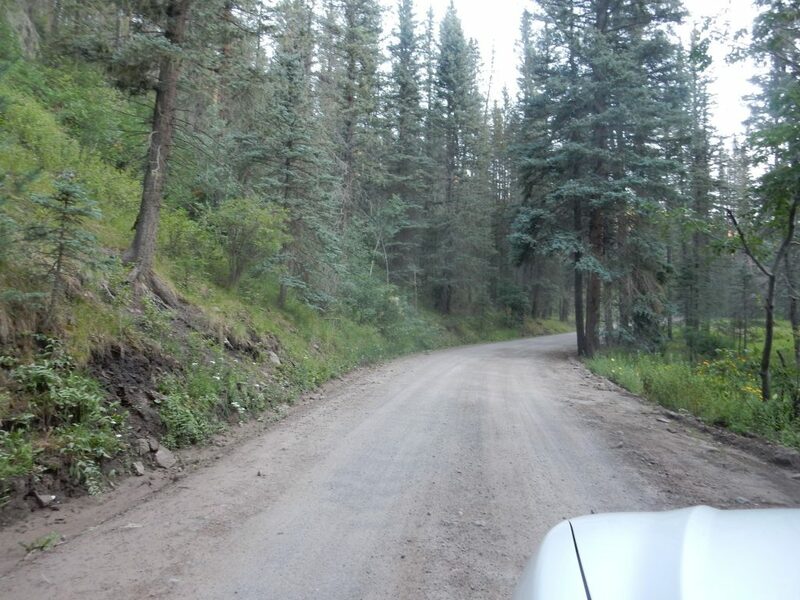 We’re going to see lots of examples of older calderas, eroded to expose some of their plumbing, after I meet up with Bruce in Colorado after the Budge reunion. Cerro la Jara is particularly dramatic. I think this is probably my Ansel Adams moment for the day. Since the fire was naturally caused, it’s fair as a nature shot. I take the scenic shortcut through the mountains. 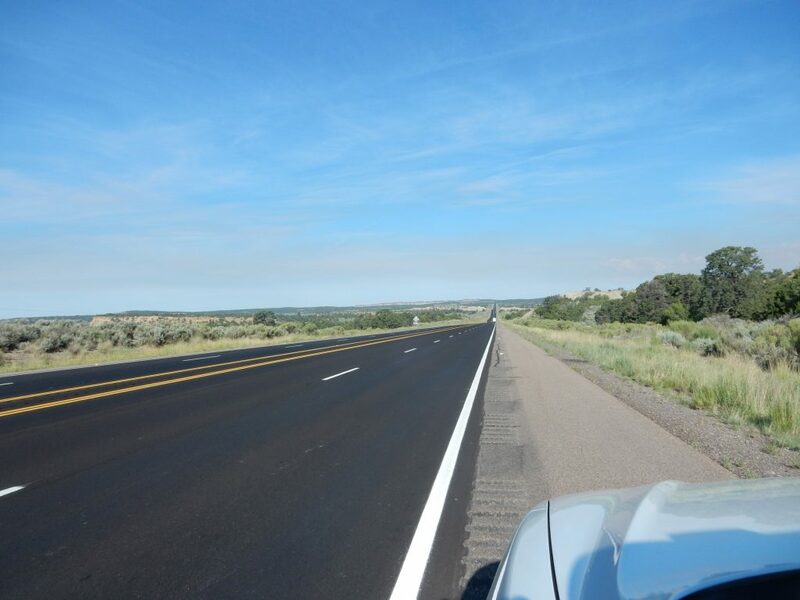 Route 126 is a gravel road in its middle third, but it’s a well-maintained gravel road and, in good weather, is considerably faster than diverting far to the south on paved roads through San Ysidro or way to the north on paved roads through Gallina. 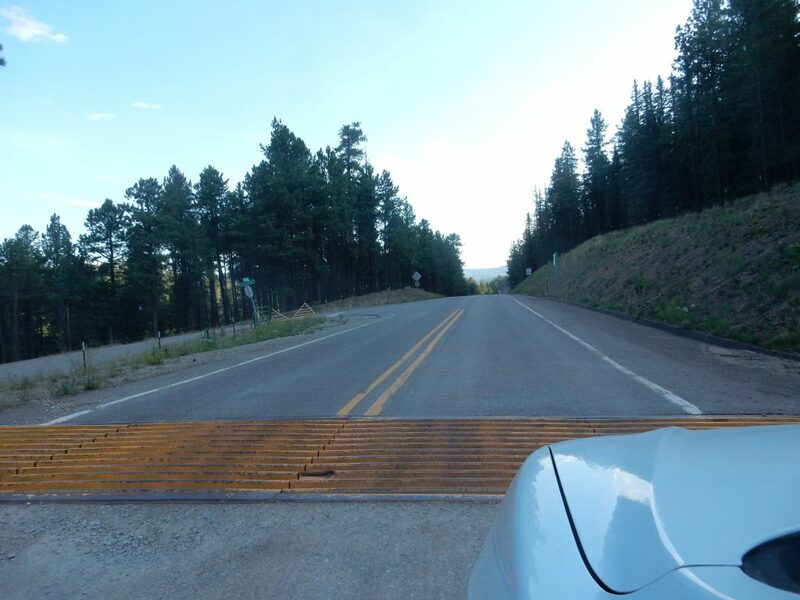 The top of the pass, which crosses a surface beveled in Tsherige Member, Bandelier Tuff. Descending through poor exposures of the Abo Formation. The Abo Formation is a Permian formation, around 210 million years old, that correlates with the Cutler Formation further north. In fact, the two merge seamlessly at about this latitude, by legislative fiat: Both names are so entrenched in the geologic literature and were first described so nearly simultaneously that geologists ruled that Permian red beds south of 36 north latitude are to be described as Abo Formation and north of 36 north latitude as Cutler Formation. 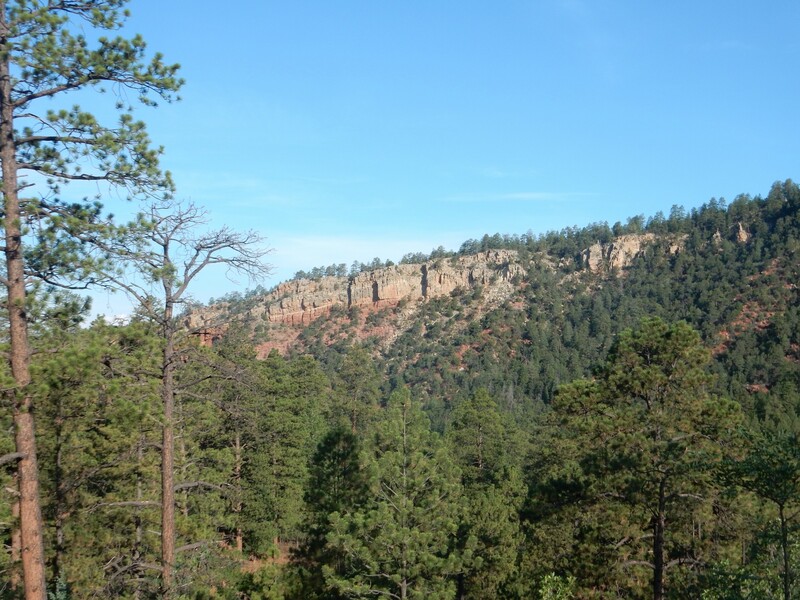 Though, to make things even more interesting, the Cutler Formation is promoted to group status in the northern Jemez and divided into the Canon del Cobre Formation and the Arroyo del Agua Formation. 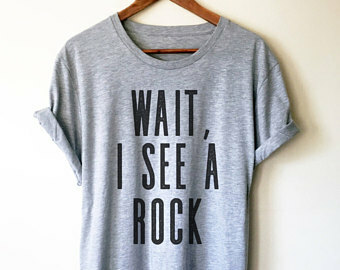 Geologists seem to love to argue about these things. The bright red roadbed is a stunning contrast with the lush green vegetation, which has received some recent rain in this area. Through Senorita Canyon, and a glimpse of Eureka Mesa through the trees. Eureka Mesa is so named for the copper deposits found in the Shinarump Formation capping the mesa. The Shinarump is part of the Chinle Group, deposited in a great river valley similar to the Mississippi — 230 million years ago, flowing from the Appalachians to the Pacific Ocean and passing very close to the Jemez on its way. The copper takes the somewhat unusual form of petrified wood in which the wood fiber has been replaced by chalcocite (copper sulfide). 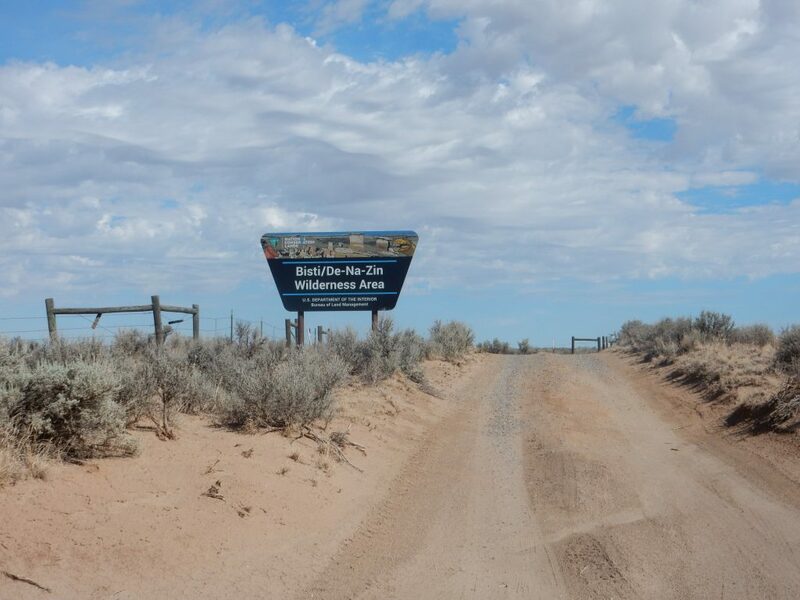 The most important mine was the Nacimiento Mine at the west end of the mesa, which was mined first by adits (horizontal tunnels) starting in the Spanish colonial period, then as an open pit after World War I, then by leach mining using sulfuric acid in the 1980s. The latter was a failure, and it also left quite a mess to clean up. 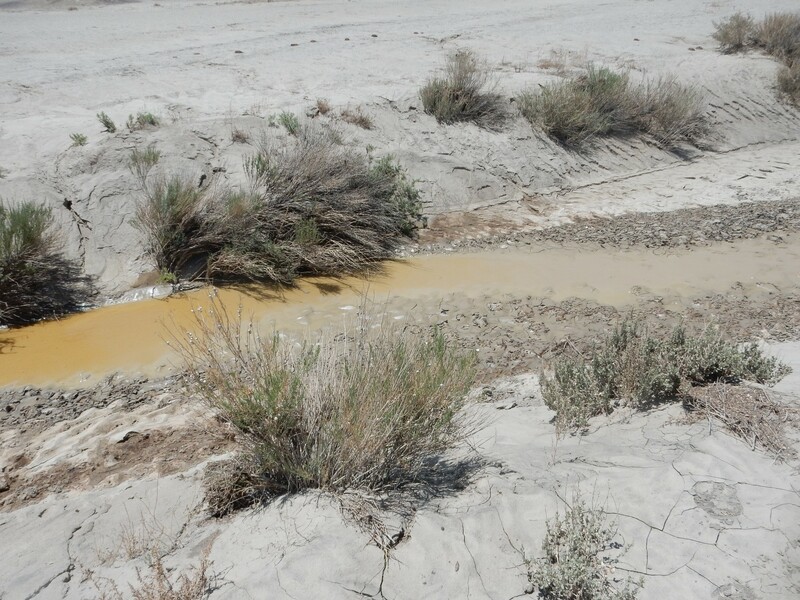 This is being done by bioremediation, using sulfur bacteria to remove the sulfuric acid from the waste water and precipitate out the toxic heavy metals. All of this ground will look familiar to long-time readers of my blog. Through the town of Cuba (where I refuel) and out into the San Juan Basin. Even here, there is some smoke from wildfire. 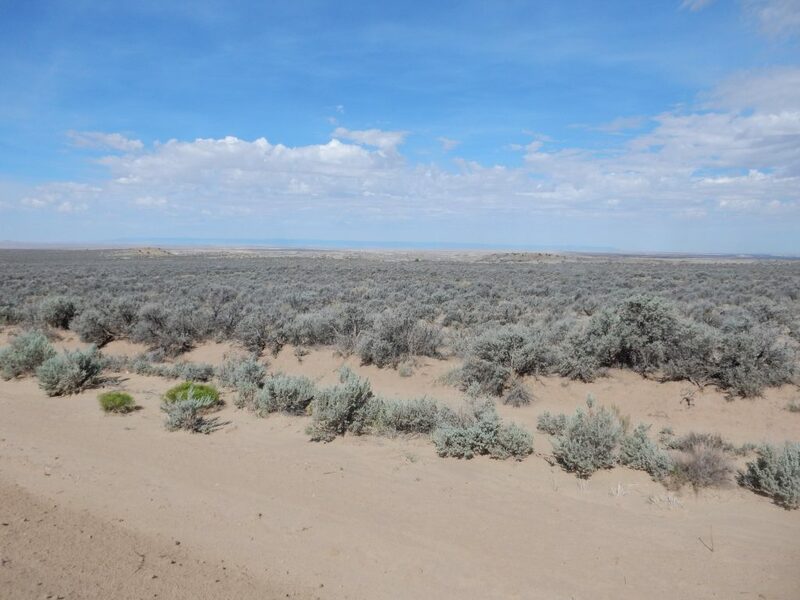 The San Juan Basin is the southeastern part of the Colorado Plateau, a great block of the Earth’s crust that has been stable for over six hundred million years. 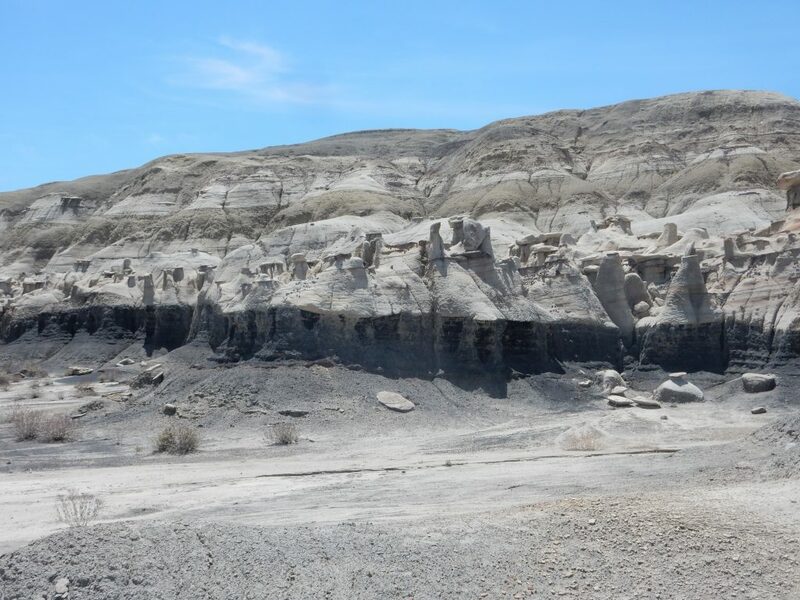 During most of this time, the plateau has been slowly subsiding, building up a thick sequence of sedimentary beds recording most of those six hundred million years. In the last thirty million years or so, the Colorado Plateau has been elevated again as western North America drifts onto the East Pacific Rise, a great upwelling in the earth’s mantle. This has allowed much of the sedimentary record to be exposed by erosion in the spectacular canyons and badlands of the plateau. 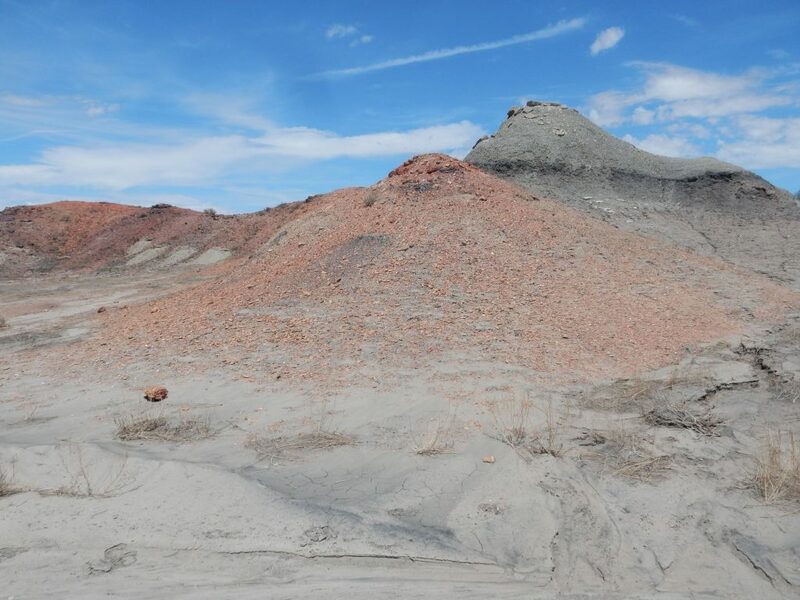 The San Juan Basin is relatively lightly eroded and is mostly surfaced in its north half by relatively young beds of the Eocene San Jose Formation and Nacimiento Formation, around 50 million years old. The San Jose Formation, a coarse sandstone, caps the mesa, while mudstone of the Nacimiento Formation forms the slopes beneath. 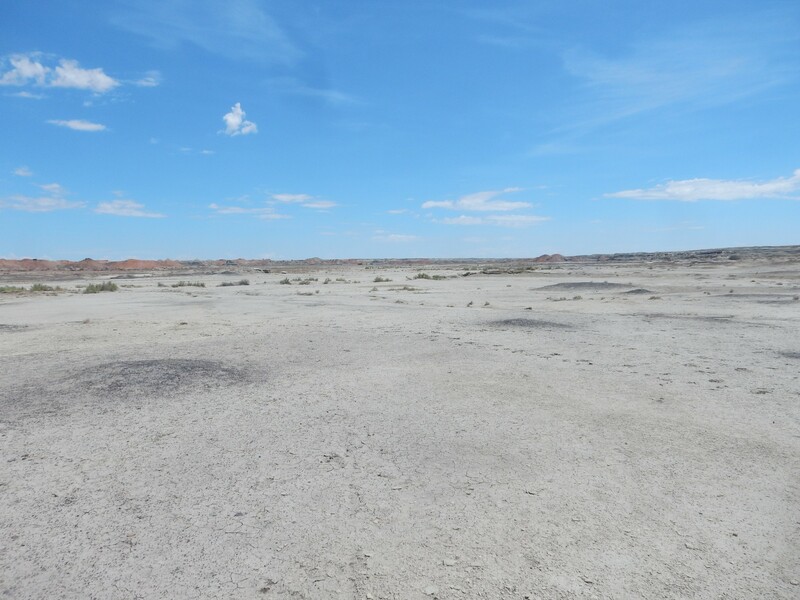 Older beds are progressively exposed as one goes south in the basin, and in a thin zone around its edges. 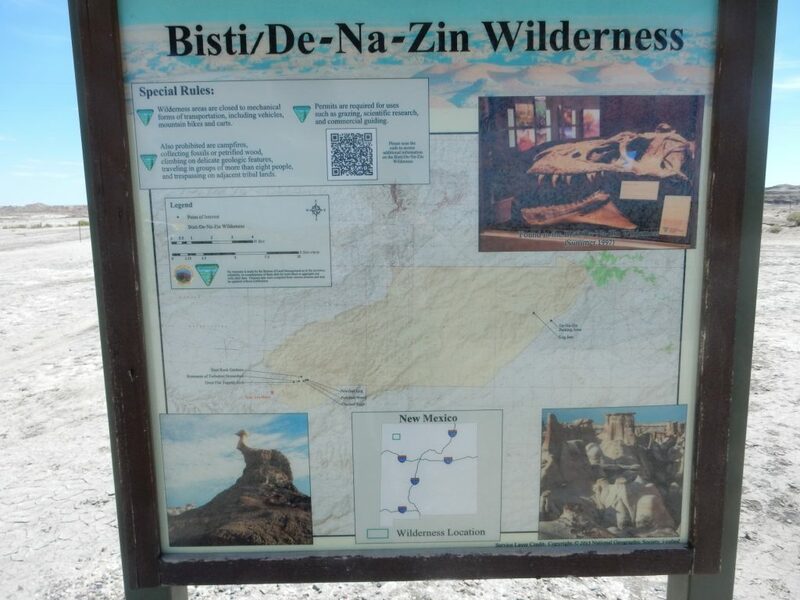 My first destination is the Bisti/De-Na-Zin Wilderness. 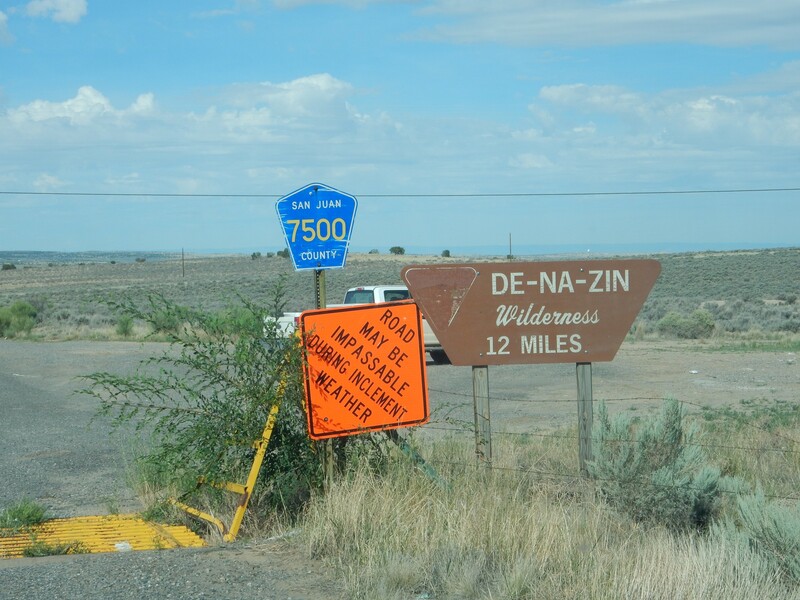 It takes a couple of tries to find the entrance road to the eastern, De-Na-Zin, side. 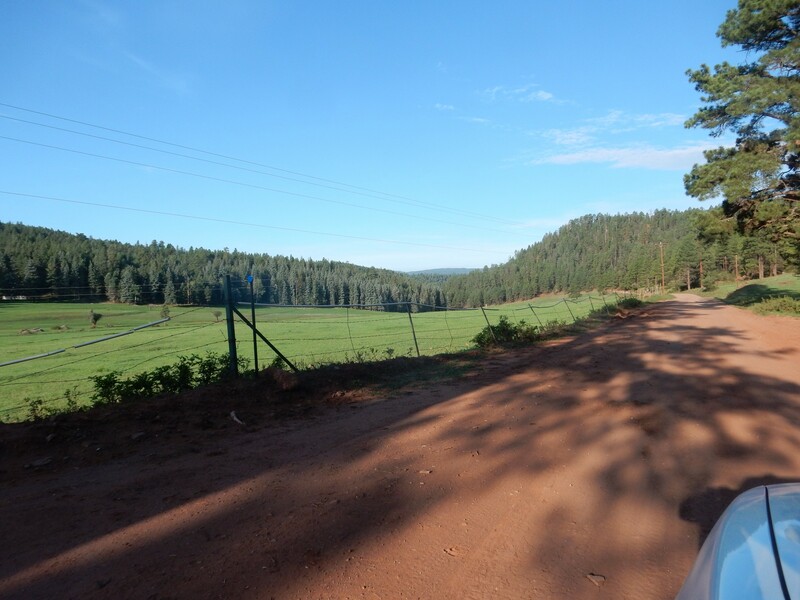 The road is a good gravel road, and the De-Na-Zin Arroyo soon comes into view. 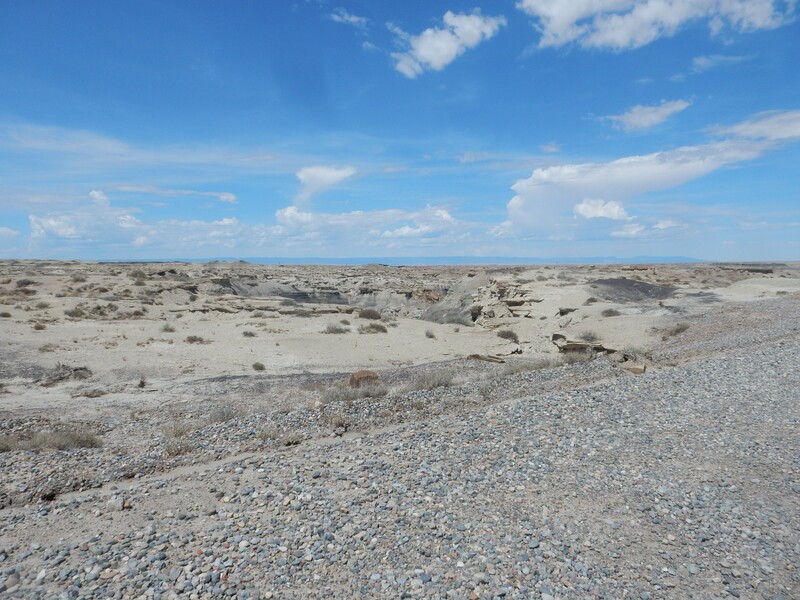 The road turns to skirt the southern boundary of the wilderness, passing several wells of the Bisti oil field. One is still pumping. 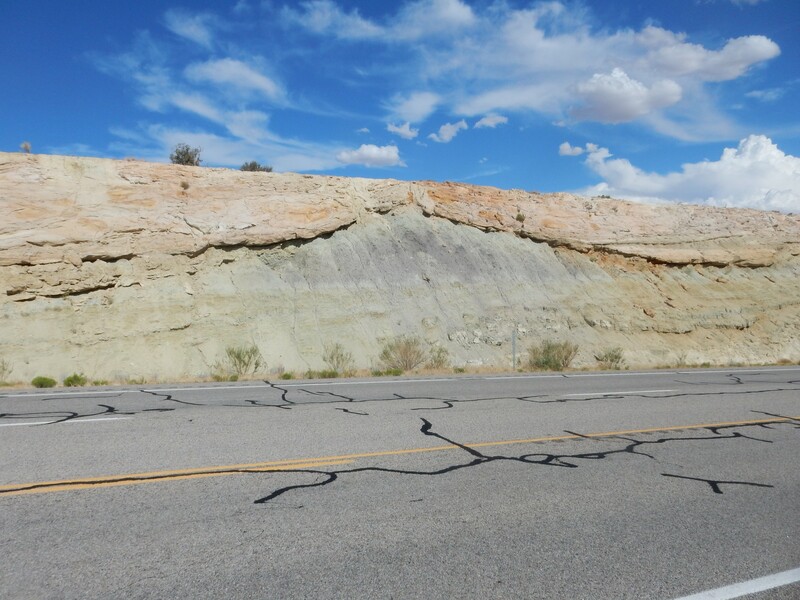 The very flat surface here is underlain by Nacimiento Formation over a resistant sandstone layer of the Ojo Alamo Formation. The Ojo Alamo Formation is distinctive in that it spans the Cretaceous-Tertiary (K-T) boundary, more correctly known nowadays as the Cretaceous-Paleogene boundary (K-P), though the older name is still more commonly used in practice. The Cretaceous is the last period of the Mesozoic Era, and the Paleogene is the first period of the Cenozoic Era, and the boundary between the two, at about 65 million years ago, marked the asteroid impact in the Yucatan Peninsula that destroyed all non-avian families of dinosaurs. The turnoff to the parking area. I park, put the sun shade over the dashboard of the Wandermobile, activate the “Hitting the trail” message button on my Spot-3 satellite messenger (I’ve already got the track feature on), slather myself with polyphenols against the sun, grab my pack, water, and stick, and prepare to head out. It’s good I got here early; it seems likely to be a very hot day, but it’s still well before noon and at the moment a moderate breeze is blowing, which provides enough wind chill to bring the effective temperature down to 80 or so. I sign the log, though it seems a bit superfluous with my Spot-3. I suppose it heartens the rangers to see people signing the log book, though some of the comments are off-putting; seems some folks found the arroyo disappointing. Heading down the trail across the Ojo Alamo flats. And the arroyo suddenly comes into view. The geology here is straightforward. 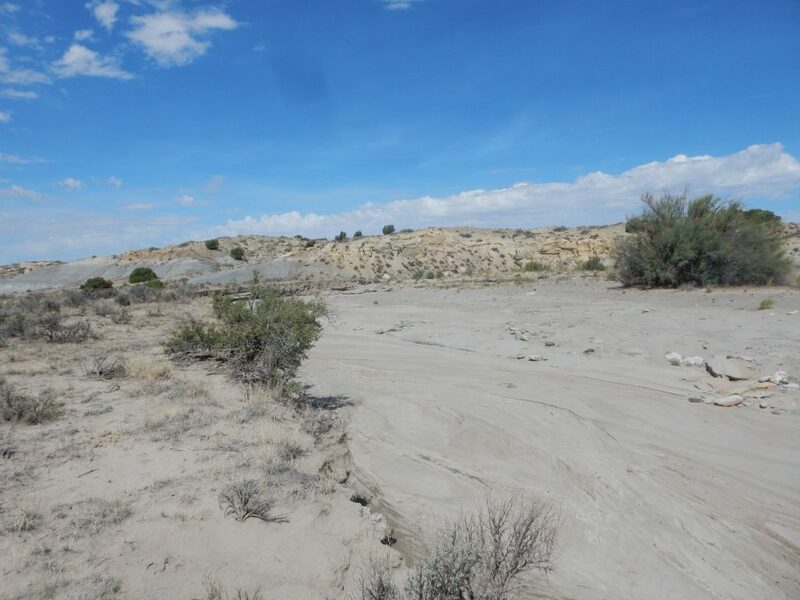 The lower arroyo has cut through the resistant Ojo Alamo Formation into the much softer beds of Kirtland and Fruitland Formations beneath. 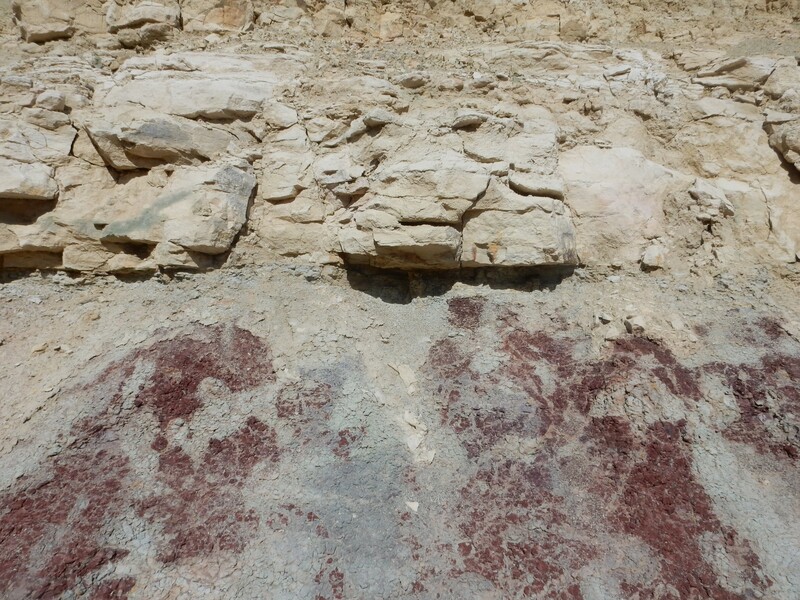 These are late Cretaceous mudstone formations that are often spectacularly colored. They are also a little like Rosecrans and Guildenstern in Hamlet; always seen together and difficult to tell apart. Beneath is another formation, the Pictured Cliffs Sandstone, that is here a fairly resistant formation. 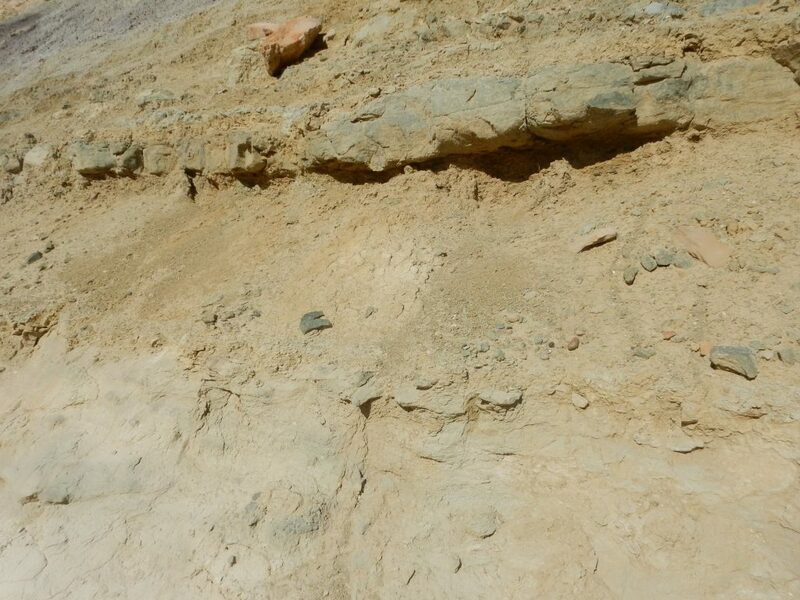 Above are soft beds of the Nacimiento Formation. So we will be looking at badlands eroded out of Nacimiento Formation atop the more resistant Ojo Alamo Formation in the upper arroyo, and Kirtland/Fruitland beds sandwiched between more resistant beds of the Ojo Alamo Formation and Pictured Cliffs Formation in the lower arroyo to the west. All these formations record a long period in which the San Juan Basin was accumulating sediments eroded off nearby highlands thrown up by the Laramide Orogeny, the great period of mountain building from about 80 to 30 million years ago resulting from the Farallon Plate subducing under western North America. Here I am standing on the resistant Ojo Alamo Formation, stripped of its veneer of Nacimiento Formation. The upper surface is a well-sorted fine-grained sandstone that is fairly clean. There are some erosional remnants of the overlying Nacimiento Formation nearby. 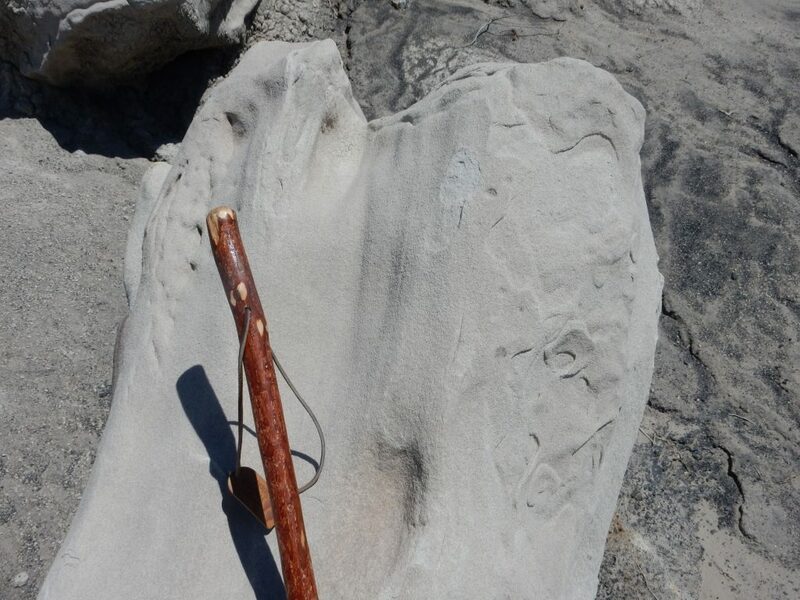 The Nacimiento Formation is another mudstone, of Eocene age. 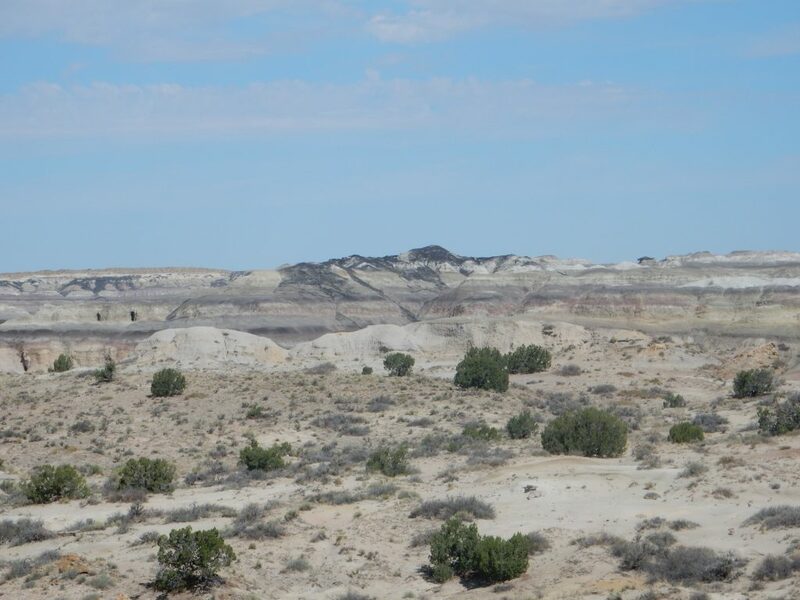 (The Ojo Alamo beneath is mostly Paleocene, but the lowermost beds are Cretaceous.) 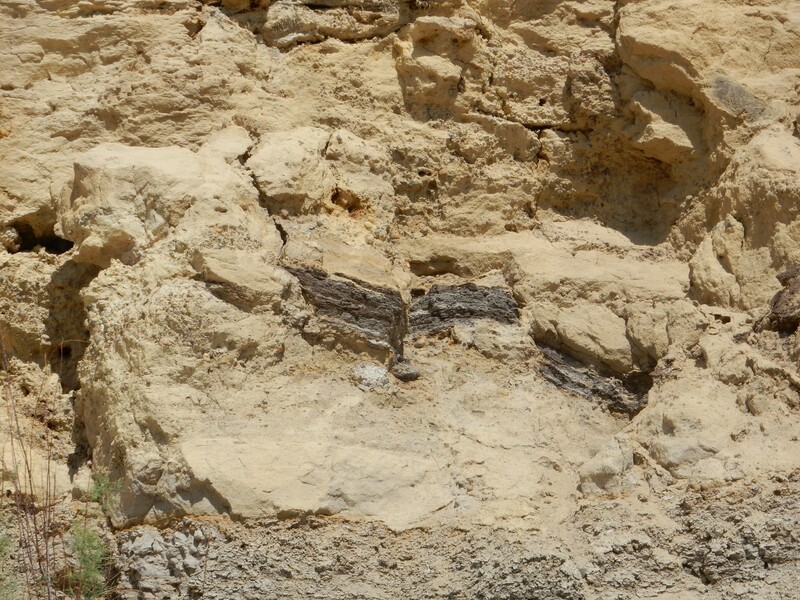 There are some layers of what looks almost like very poor coal in the formation. 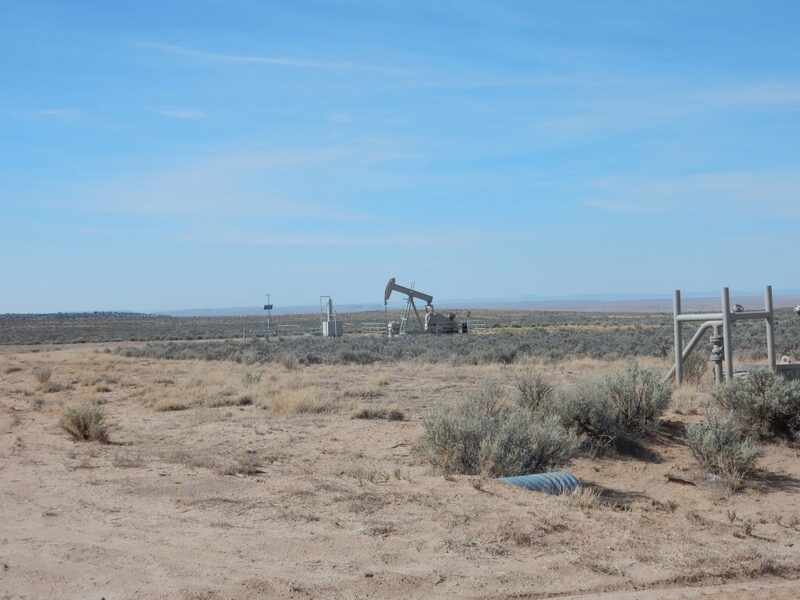 Coal beds are extensive in the Fruitland Formation and are mined around Farmington to supply the Four Corners power plant, but I’ve not heard of coal mining in the Nacimiento Formation. A close up of the Nacimiento in the hill side. 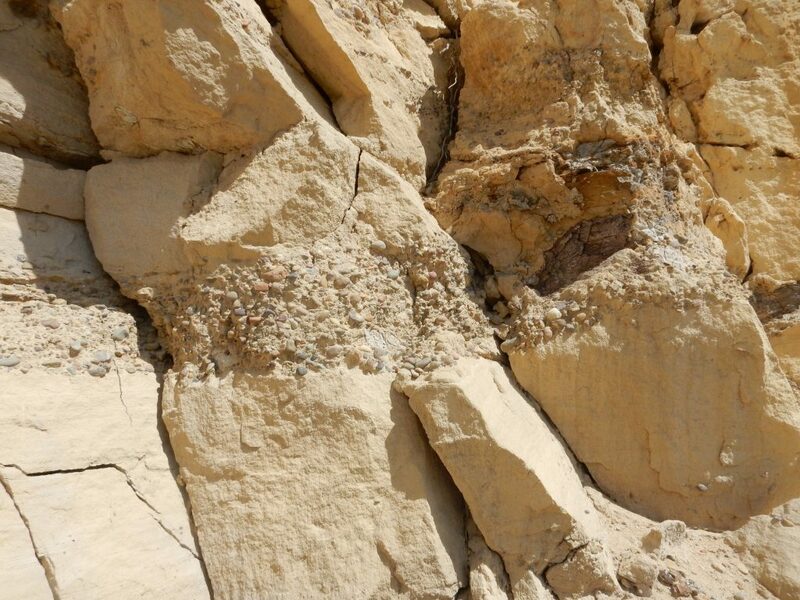 A geologist can look at an outcrop like this and learn a fair amount about it. 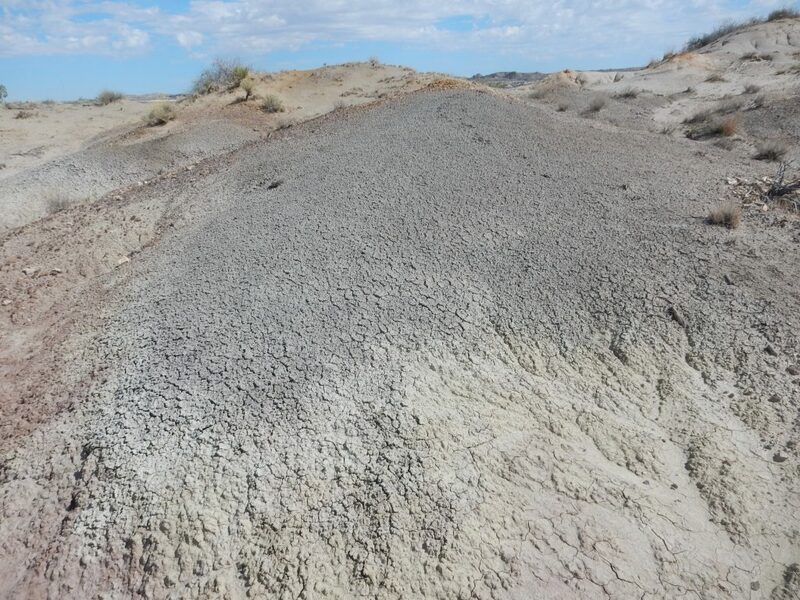 For example, the sediments clearly include a fair amount of clay, but the percentage of the clay that is bentonite from volcanic eruptions is not high, because there is not much “popcorn” texture. We’ll see examples of the latter later on. There really isn’t a clear trail here. I find myself following a small arroyo east, since this will be fairly easy to follow coming back. I can’t really get lost here, since any path south will eventually hit the gravel road, but still. A mound of Nacimiento Formation. 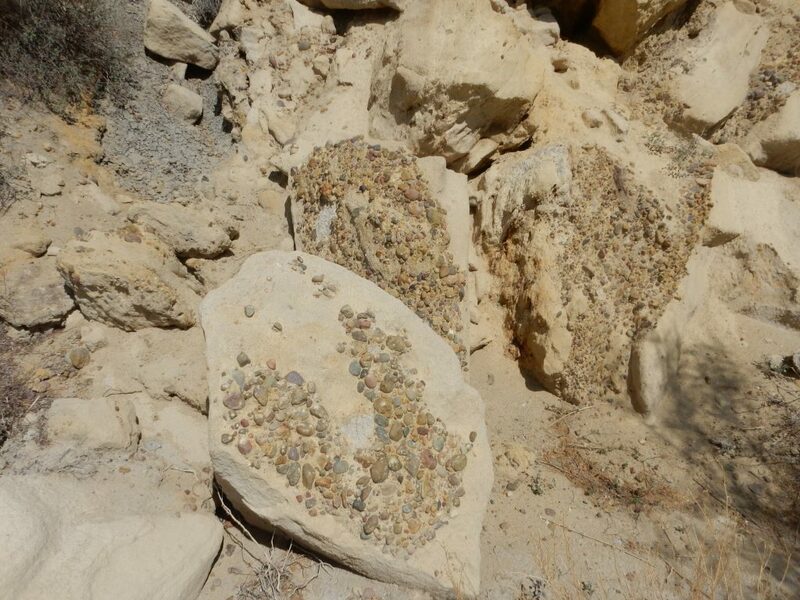 This is richer in bentonite, enough to produce some real popcorn texture. A remnant sandstone bed atop a hill. 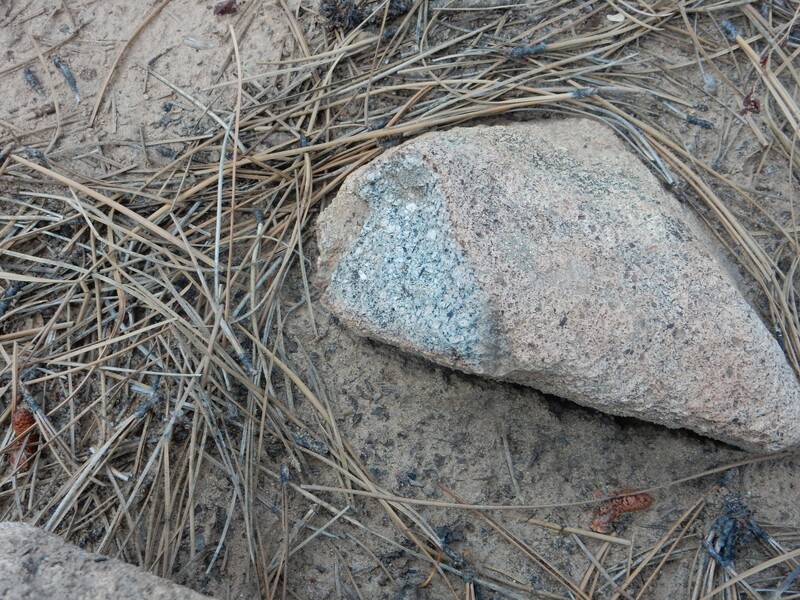 I look closely at a boulder. A miniature canyon in the Nacimiento Formation, floored by Ojo Alamo Formation. From here I hike to the lip of the arroyo proper. 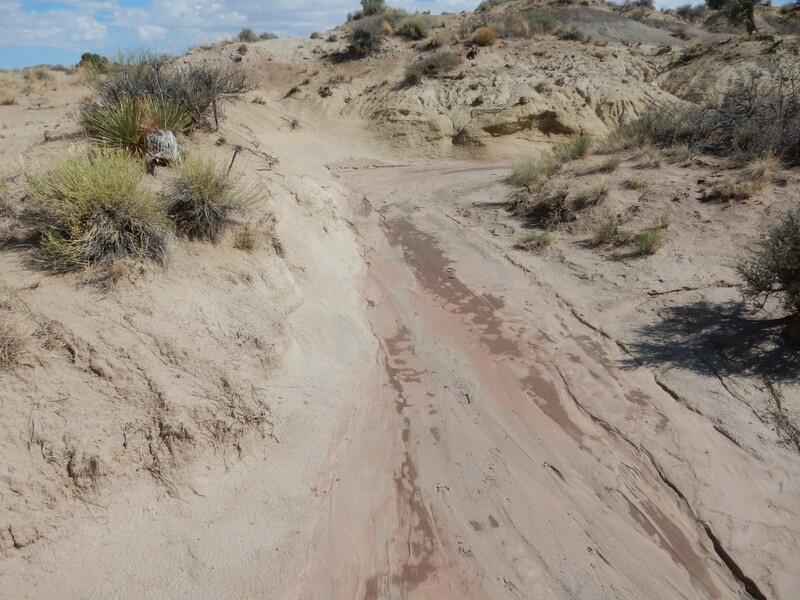 This is the upper arroyo, where the drainage has cut into the Nacimiento Formation but has not yet cut through the underlying Ojo Alamo Formation. In the distance is an interesting looking hill. This seems to be in the right direction and distance to be a feature labeled Black Hill on my map. The dark material is apparently a very dark bed of the Nacimiento Formation, of which there are certainly plenty. I follow this to a second cairn marking a good overlook. 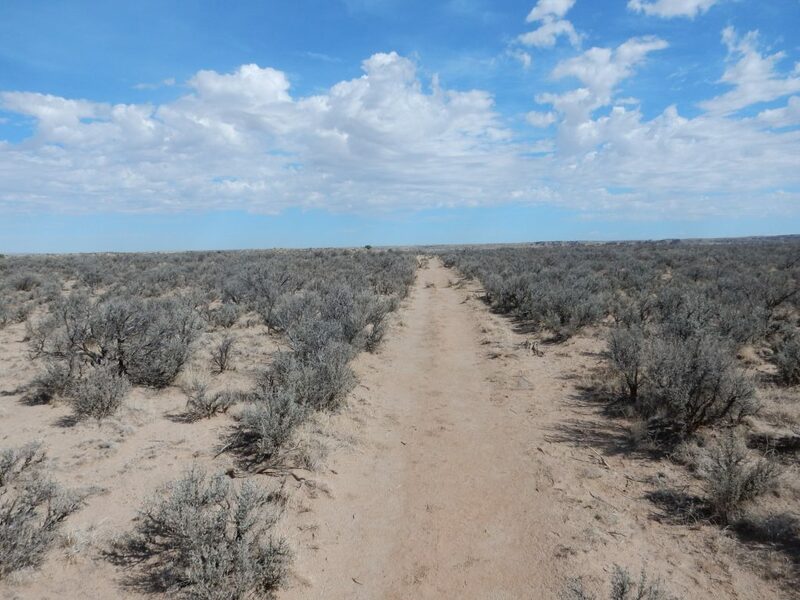 The lower arroyo, to the left, has cut through the Ojo Alamo into the underlying Fruitland/Kirtland Formations. 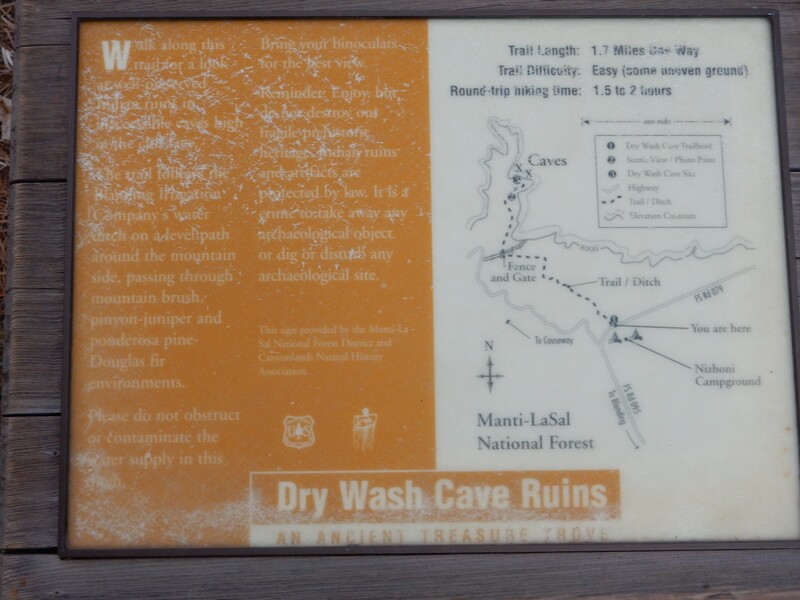 I decide this is worth a closer look, and discover more cairnage leading the way to the arroyo. The stratigraphy becoms clearer when I reach the arroyo bottom and look downstream. The gray beds to left are Kirtland/Fruitland mudstone. These are capped by Ojo Alamo sandstone. Everything in the foreground is geologically young alluvium, sediments carried and deposited primarily by water. I find a way down into the actual arroyo bed; it’s a very sunny day so I’m not too worried about flash flood. There is a small rock cairn here on the lip, suggesting I’m on the path to something. Note the very flat arroyo bottom and the very flat terrace forming the arroyo lip. 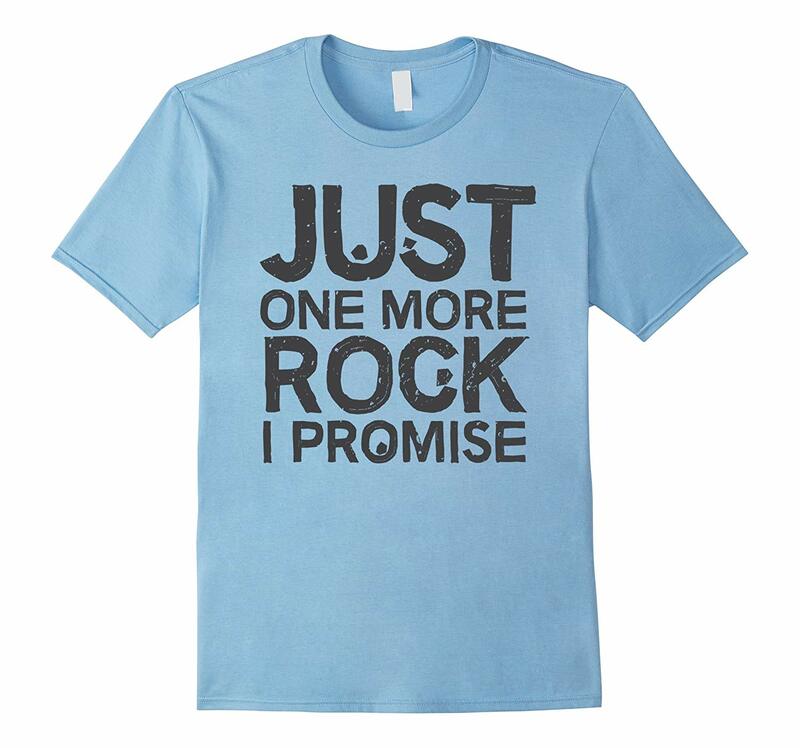 These tell a geologist that there was a change in base level in the recent geologic past. The arroyo had cut down to the terrace level, which corresponded to some knickpoint downstream made of more resistant beds that set the arroyo level. 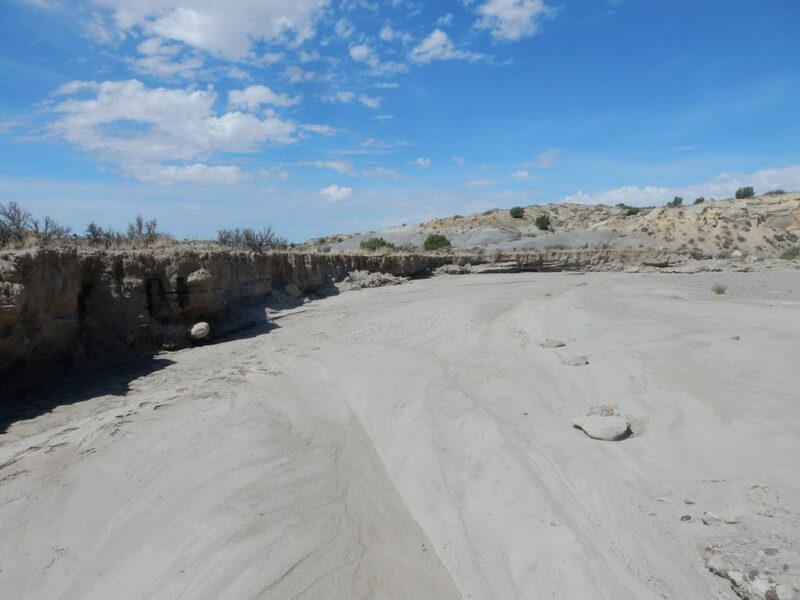 Recently (in geologic terms; within the last 12,000 years) the knickpoint was eroded through and the arroyo began rapidly cutting down to its present level, abandoning its former flood plain as the terrace here. I follow the arroyo to the contact between the Fruitland/Kirtland and overlying Ojo Alamo Formations, really more on a hunch than anything. Contacts between formations are like turning a page into a new chapter in the Earth’s history. However, not all are as obvious as this one. I approach for a closer look, and Holy Cow! That looks like petrified wood towards the bottom of the Ojo Alamo Formation. Rather large pieces. 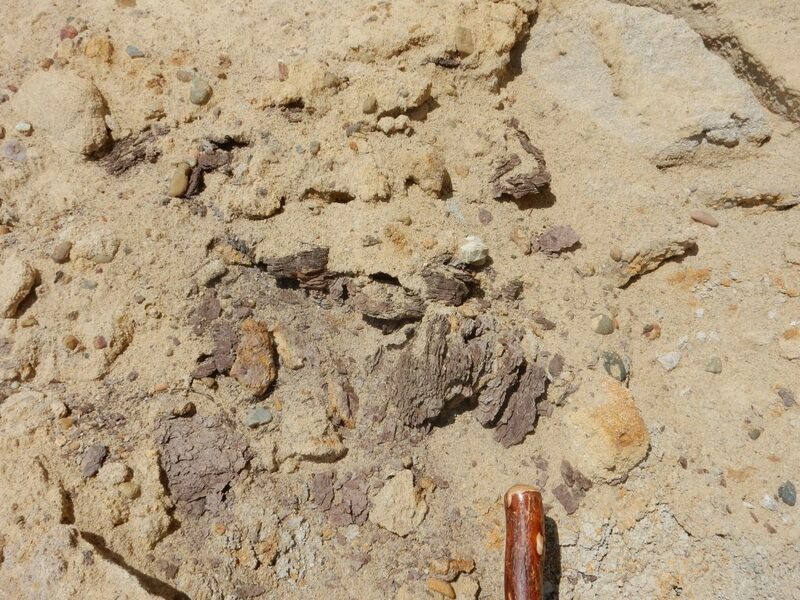 I realize that there is a conglomerate (coarse gravel) bed within the sandstone of the Ojo Alamo that contains numerous large pieces of petrified wood. 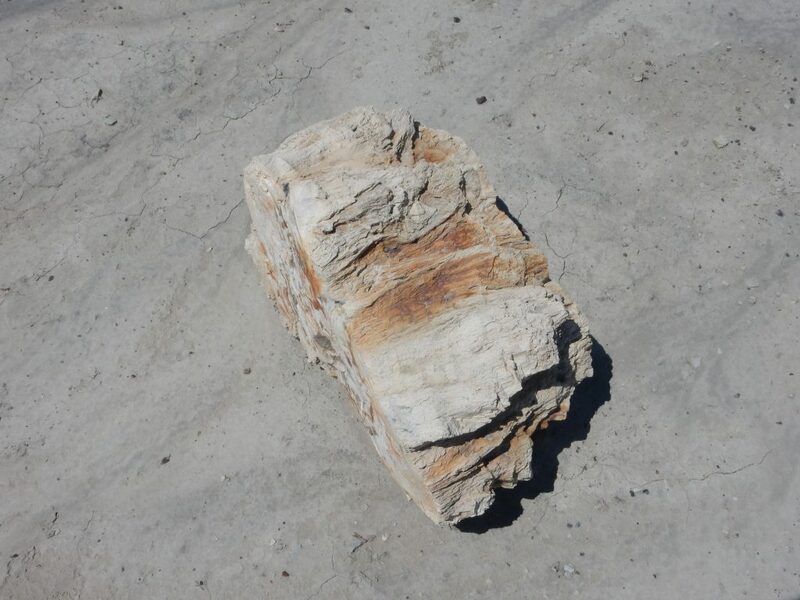 Some of the petrified wood has eroded out of the formation. It’s not very well preserved; almost spongy or shaly in texture. It’s about how I’d imagine partially rotted wood might petrify. 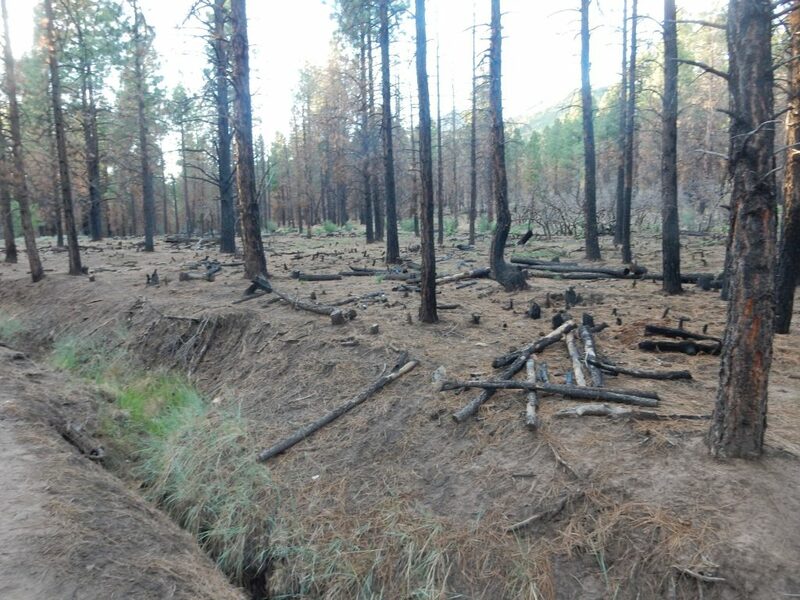 I can picture this wood being deposited by a flash flood in a river channel below an area of forest that had burned and partially rotted. Hmm. 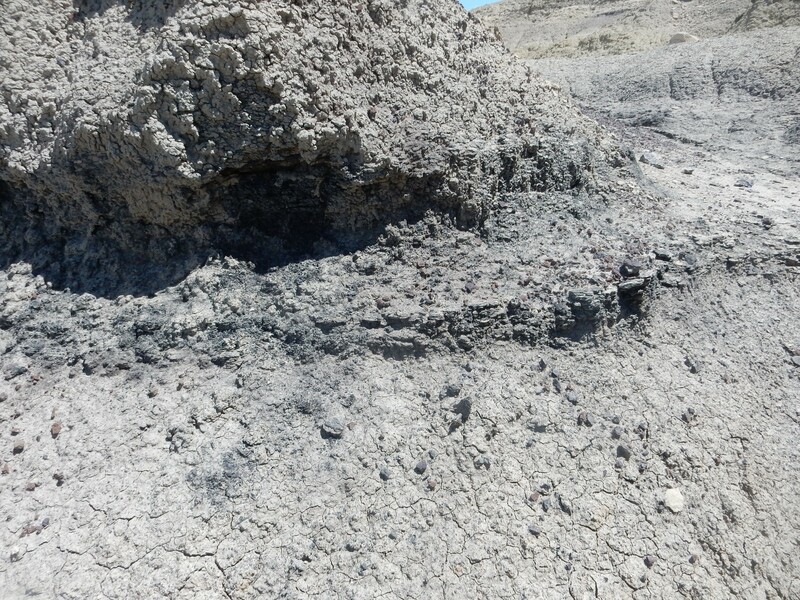 This gravel bed with petrified wood seems to be located towards the bottom of the Ojo Alamo Formation, right where the K-T boundary would be. 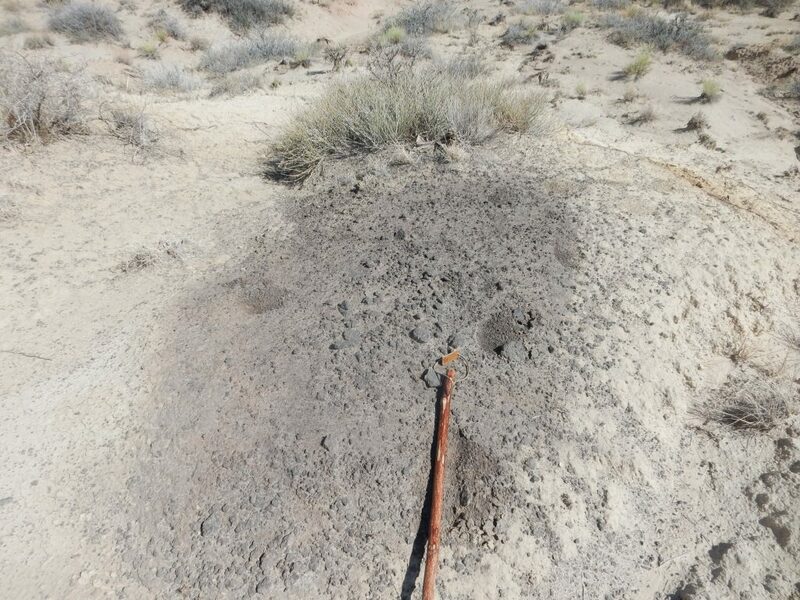 Could this be a marker of the Chicxulub impact event that killed the dinosaurs? Probably not. 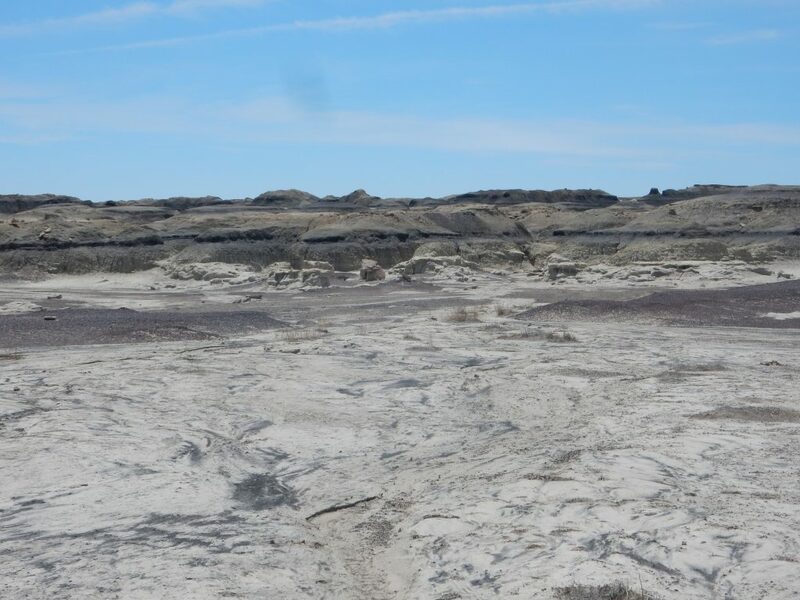 That would be too cool to believe, but besides that, the lowermost beds of the Ojo Alamo Formation thought to straddle the K-T boundary are described as mudstone, and the actually boundary is thought to be missing in a small disconformity — a gap in the geologic record. Too bad. I hike back to the car, load up, drink some water, and consider. 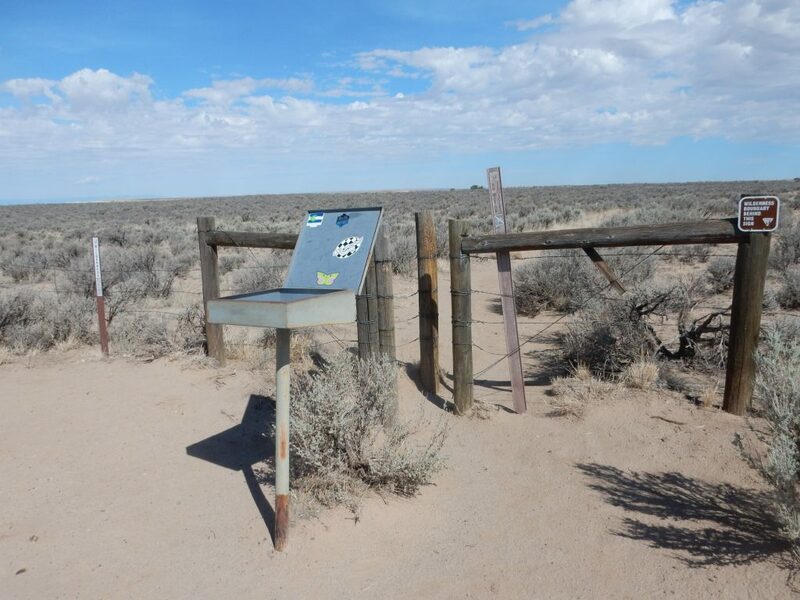 Do I have time to visit the west end of the wilderness, the Bisti end? The log book here has comments from one or two visitors saying the Bisti area is better. I decide to give it a try. Looking south along the road, a distant butte. Hosta Butte, perhaps? Chaco Canyon is also almost directly south, but I know of nothing around the canyon that this could be. 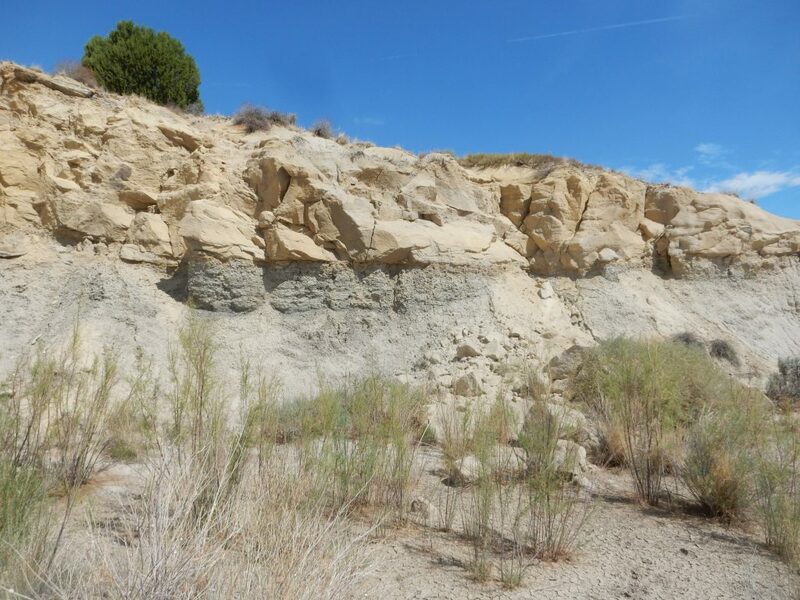 This is all mapped as Kirtland/Fruitland Formations resting on Pictured Cliffs Formation. Here the Pictured Cliffs Sandstone is exposed, with Lewis Shale beneath. By now it is noon and the breeze is dying down. It is hot out there. One does not simply walk into Mordor, so I make sure I have plenty of water and a salty snack in my pack, make sure the Spot-3 is tracking, and head out. I confess I found this vaguely deflating. I walk in the direction my compass shows is just north of east, and eventually come across some moderately interesting beds. It’s a bed of very poor quality coal, really little more than carbonaceous shale. I continue on towards an outcropping of sandstone. It appears to be a well-sorted fine sandstone. I climb to the top of a ridge. I come across some petrified wood. I figure I should be in the area marked as a petrified stump forest by now. (After getting home and checking: Not even close.) All I see are concretions in the beds. These cannot be mistaken for petrified wood. Further north are hills of a peculiar reddish color. I go examine a fragment of the red stuff. It looks like iron-stained thin limestone but feels like chert. To the southeast is a goblin colony. I suspect it’s still a ways to go to the good stuff. (Correctly, it turns out; I’m just over halfway there.) But it’s becoming a blast furnace out here, and I have a ways to drive further to my campground. I turn back. Astonishingly enough, there is a muddy arroyo across my path. It takes some time to find a way across. And then I’m back at my car, somewhat disappointed with this second venture into the Bisti/De-Na-Zin Wilderness. Well, next time I’ll have a much better idea how far to walk. And I won’t do it at noon in friggin’ July. I drive north, and eventually cross a ridge and find myself looking into the Farmington area. I do feel a little like Frodo entering Ithilien after being frustrated at the gates of Mordor. 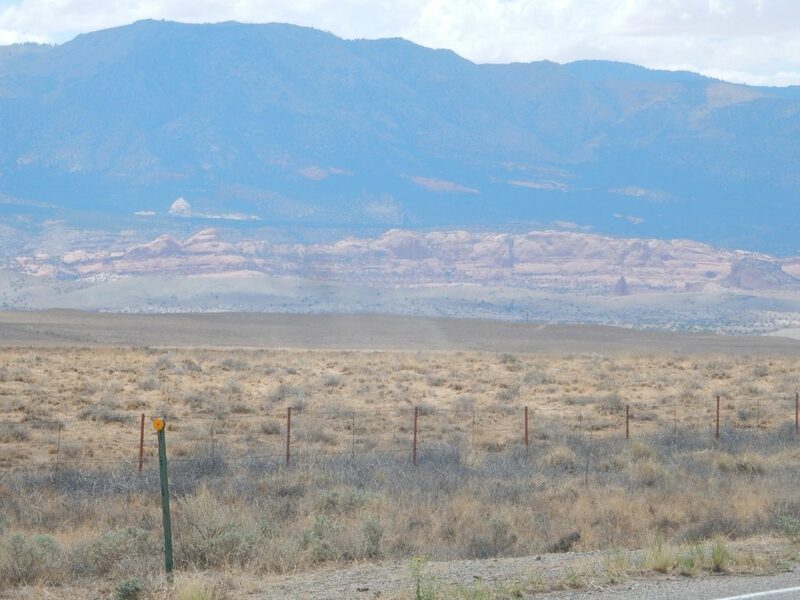 South of Farmington I cross a plain covered with eroded sandstone beds. This turns out to be more Ojo Alamo Formation. The road descends through a cut. 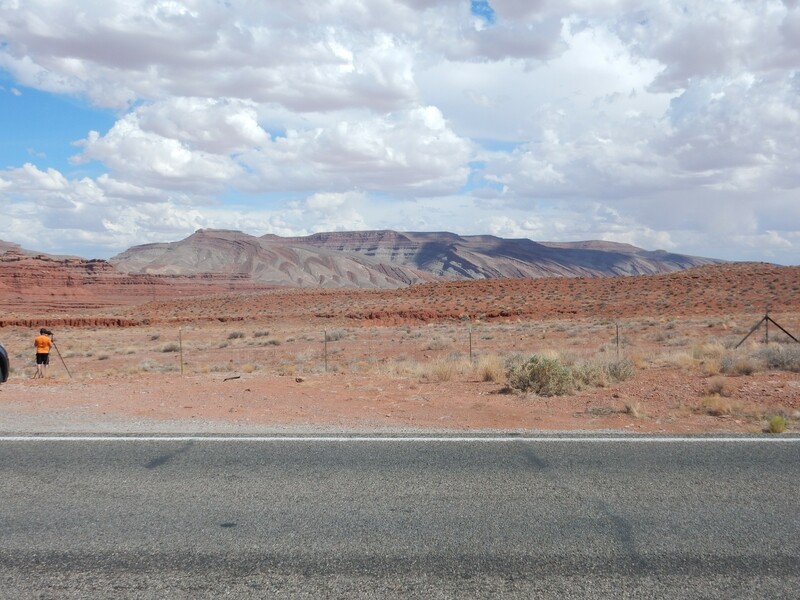 Through Farmington and Shiprock, and west towards Kayenta. I’ve photographed it many times, but I can’t resist one more photo of Shiprock. 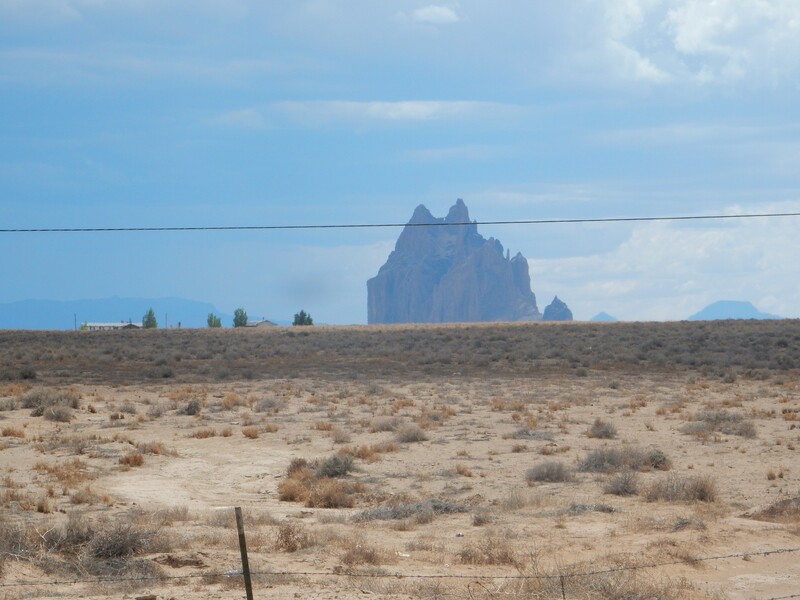 Shiprock is perhaps the most famous example of a volcanic plug, the neck of a large cinder cone. The surrounding loose cinder was eroded away to leave the more solid rock formed by lava solidifying in the throat of the volcano. 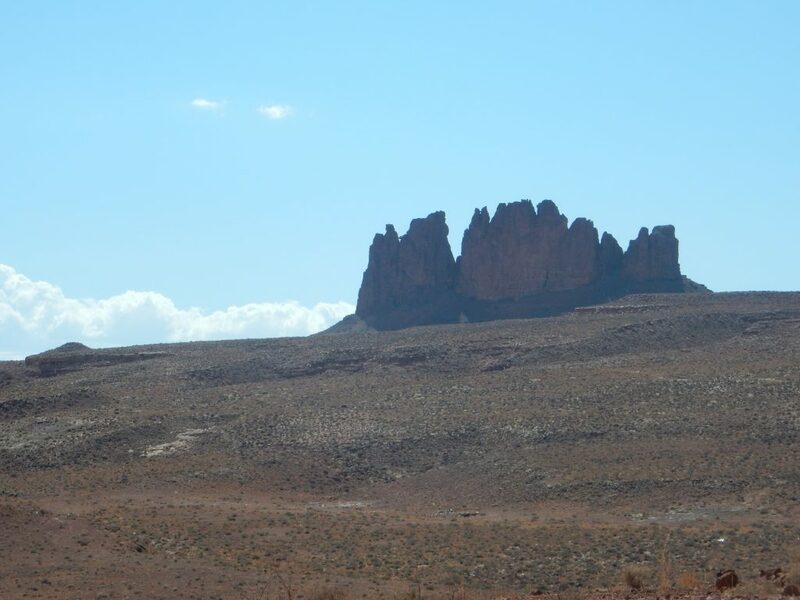 Shiprock is a bit distinctive in that it is made of an unusual rock called minette, which is very high in potassium. 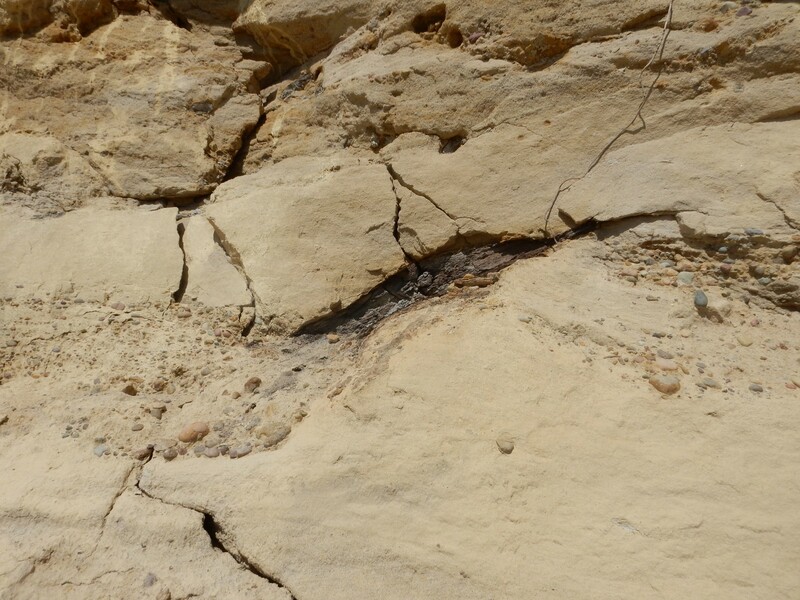 This is one of the first elements to melt when mantle rock reaches the melting point, and the high concentration shows that very little of the mantle source rock melted; just enough to separate from the rest of the rock and rise through the crust to erupt here. 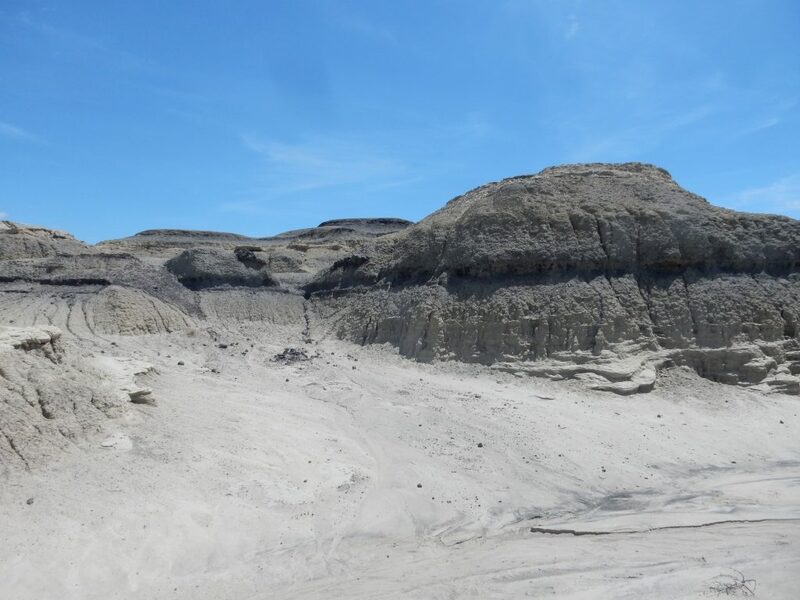 This all happened in the Oligocene, about 25 million years ago. Ahead are the Chuska Mountains, and the Beclabito Dome. The Beclabito Dome is a local upwards warp in the crust that is rounded in shape. Apparently the rock was domed upwards by magma intruding into the deeper levels of the crust without quite breaking through to the surface; a laccolith. 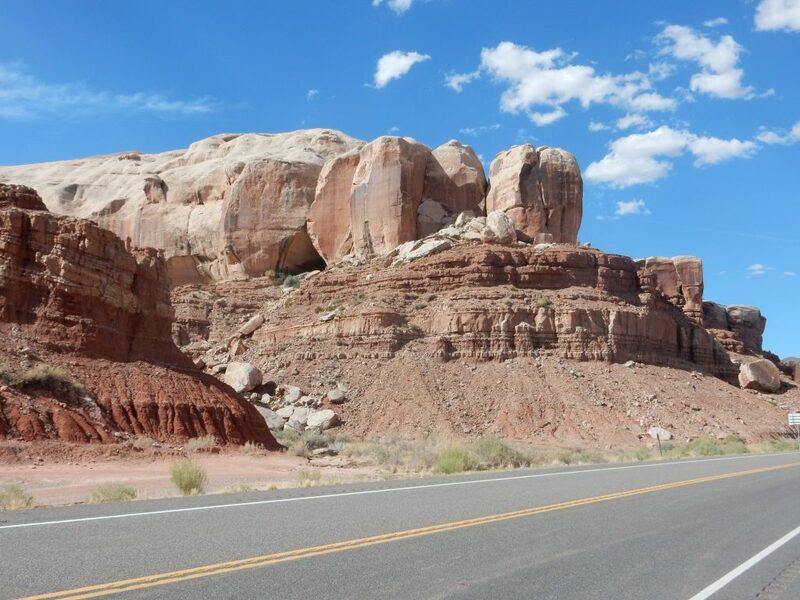 I continue on, turning north into Utah past cliffs of the Entrada and Morrison Formations. 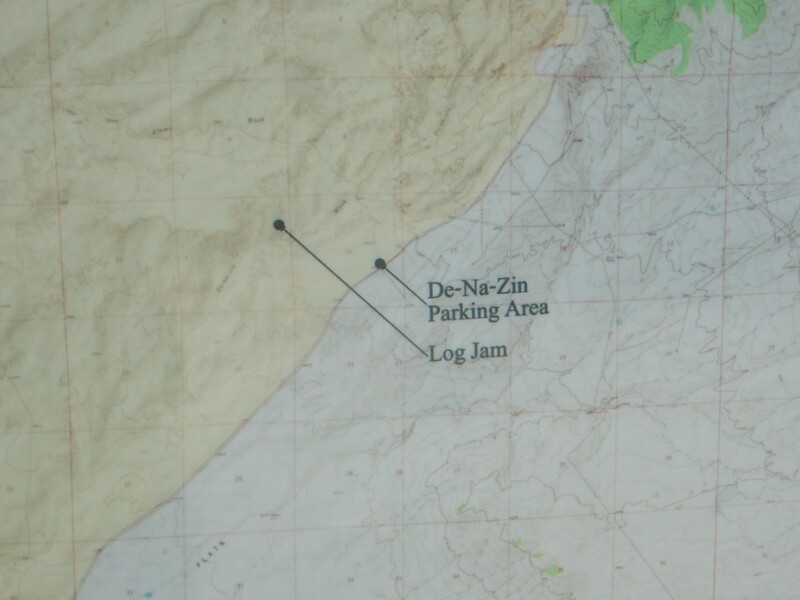 I think; I have no geologic map for this area. 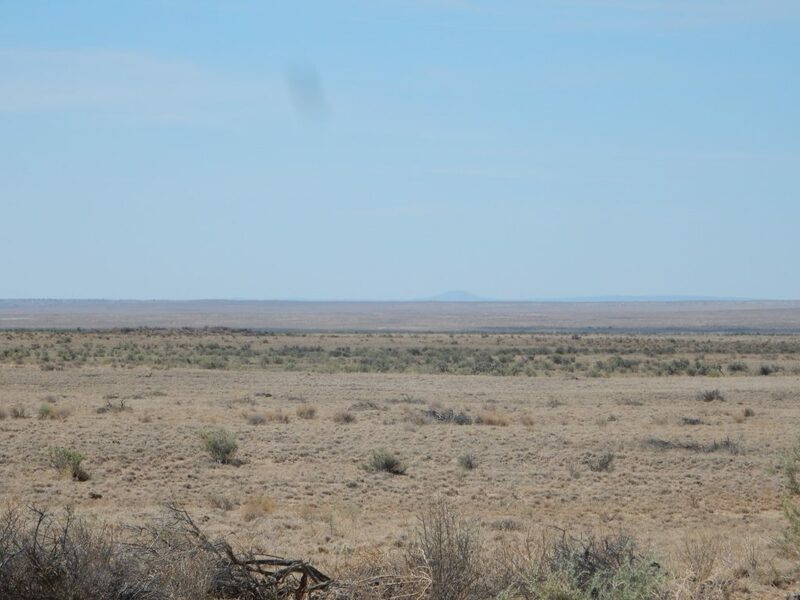 North is a beautiful view of Comb Ridge. I bork the photograph. But it’s okay. I cross the San Juan River, turning left towards Mexican Hat — new ground to me. Comb Ridge is just ahead. 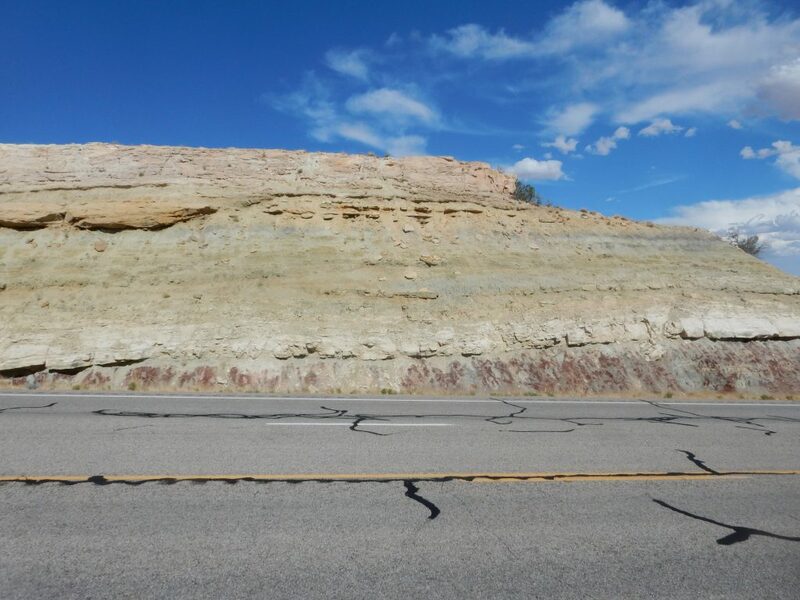 Comb Ridge is a monocline, an area where a fault in the deep basement rocks beneath has warped the sedimentary beds upwards. 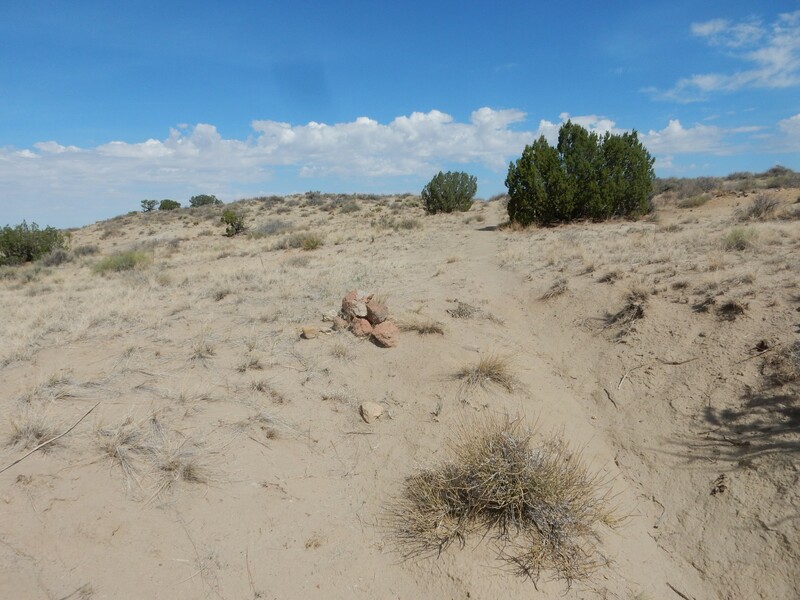 This side of the ridge is underlain by resistant beds of the Navajo Sandstone from the beginning of the Jurassic, about 190 million years old. Beds exposed further west are progressively older. 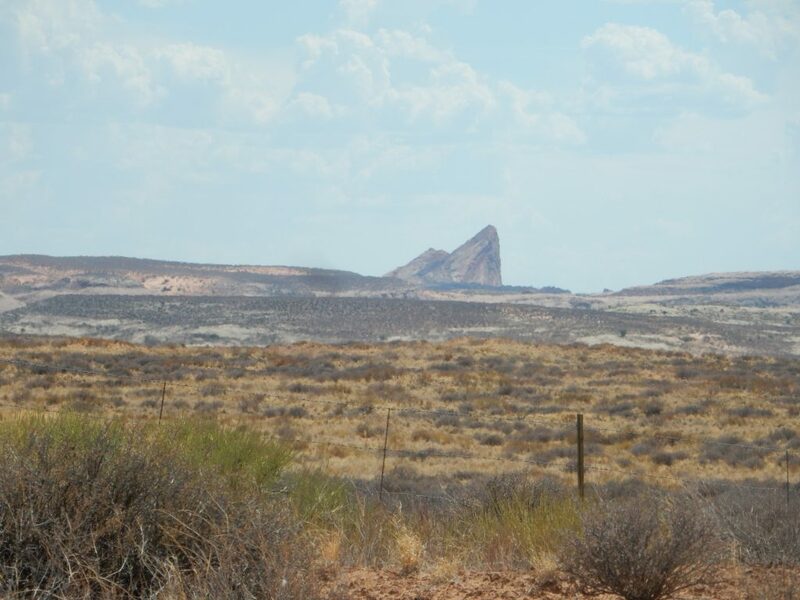 Far to the south is a particularly spectacular pinnacle of Navajo Sandstone. I can’t be sure, since I’m new to this area, but I think this is Mule Ear. 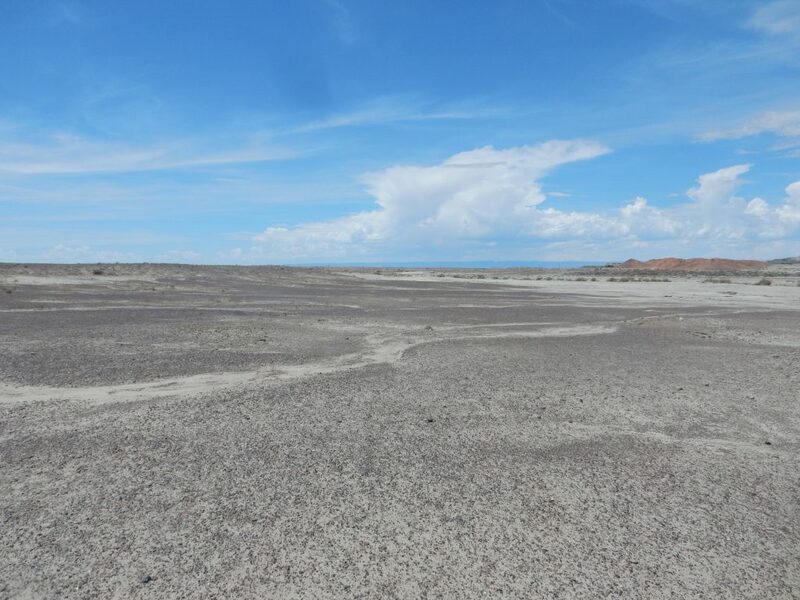 Just to its west (not visible from here) is an eroded diatreme, a kind of volcanic crater similar to those in which diamonds are sometimes found. (Not in this case.) It’s an area I’d love to visit, but it is very difficult to get in to. For one thing, it’s within the Navajo reservation, so I would be require to hire a Navajo guide. 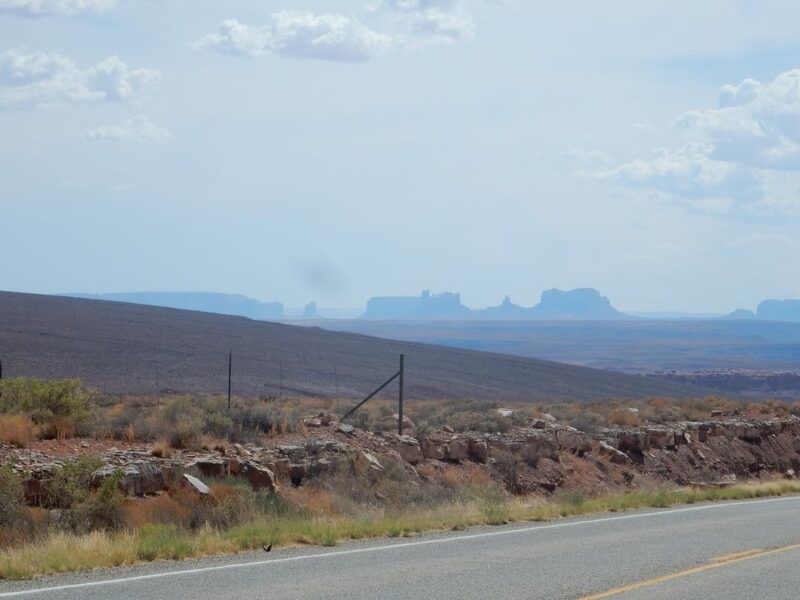 From the approaches to Mexican Hat, one can see into Monument Valley. It’s an area I ought to visit sometime, but there isn’t enough time to do it properly today. The west side of Raplee Ridge. Raplee Ridge is the western side of the Raplee Anticline, a bulging upwards of the earth’s crust west of Comb Ridge. The ridge is underlain by beds of the Rico Formation straddling the Permian-Pennsylvanian boundary, around 300 million years old. The foreground mesa is underlain by somewhat younger Cutler Formation sandstone, of Triassic age, around 290 million years. To the northwest is Cedar Mesa. In a stunning coincidence, the mesa is capped with Cedar Mesa Sandstone, a Permian formation, over beds of the Pennsylvanian Halgaito Formation. 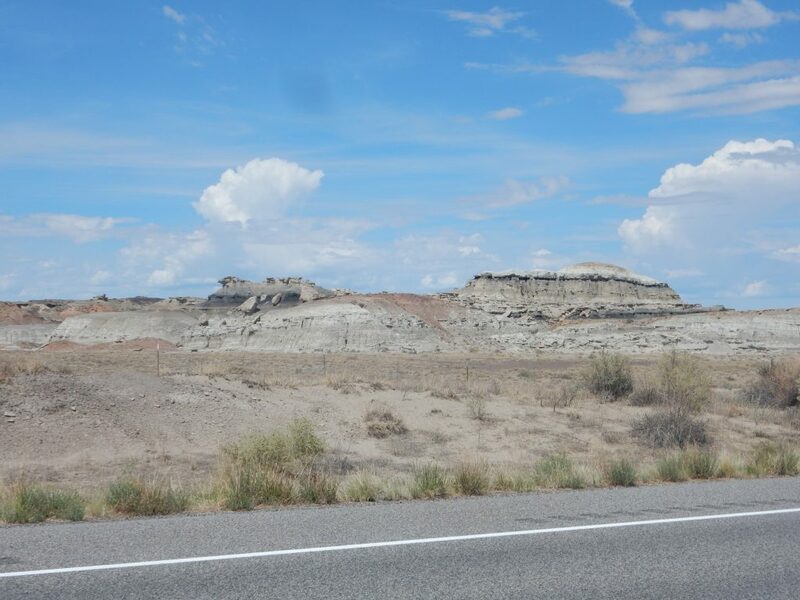 The Cedar Mesa Formation would be close in age to the Raplee Formation, but the Cedar Mesa is shoreline or shallow marine sandstone while the Raplee appears to be continental sandstone or mudstone. 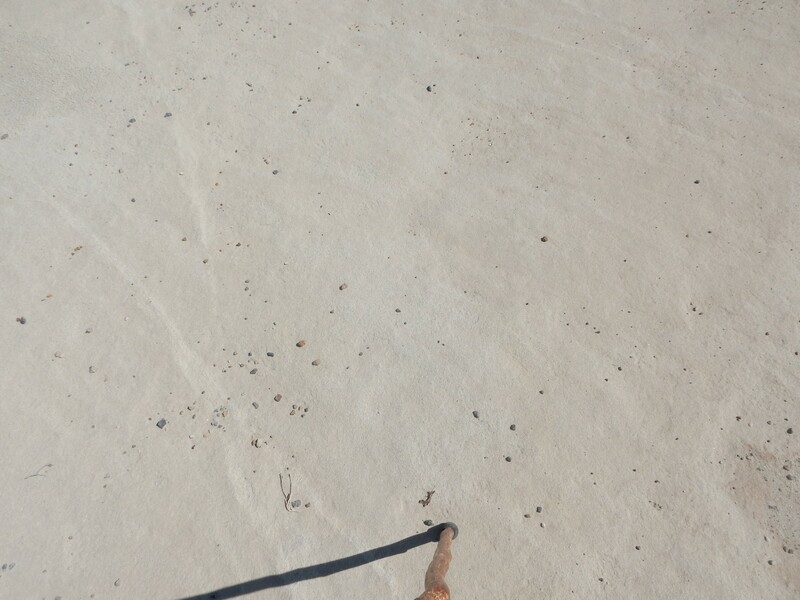 Apparently I’m standing close to the maximum southeastern reach of the Cedar Mesa sea. Another view of Raplee Ridge. 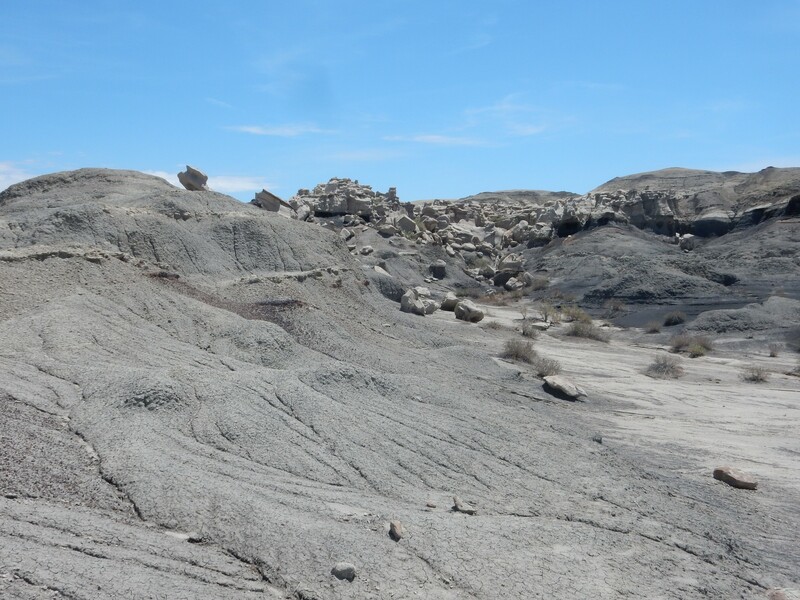 Erosion has exposed the beds of the Rico Formation in such a way as to produce a remarkable pattern. A panorama of Raplee Ridge. 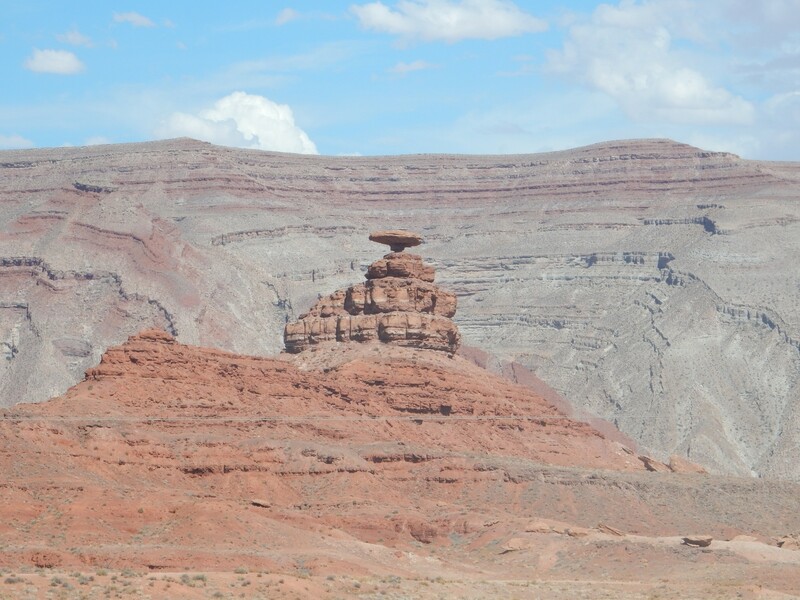 The Mexican Hat for which the town of Mexican Hat is named, with Raplee Ridge in the background. To the west, Alhambra Rock. 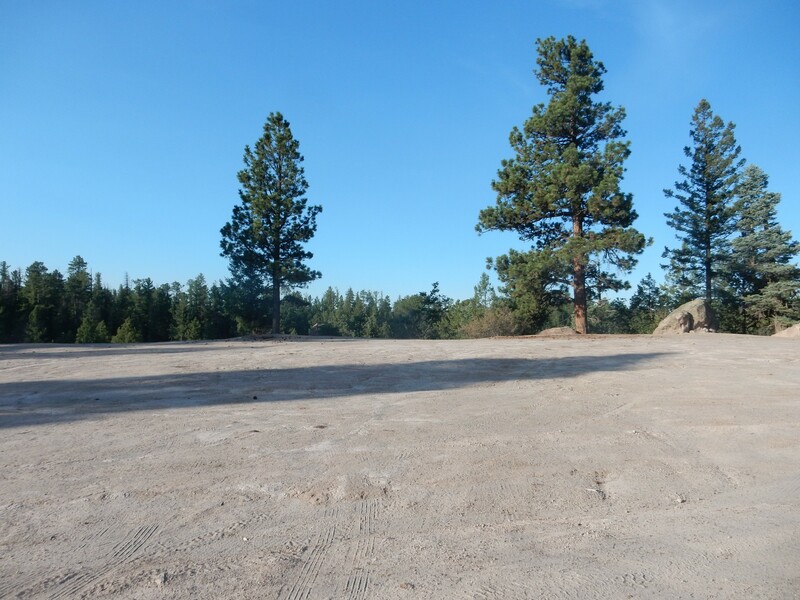 Alhambra Rock is a dike, formed from magma that penetrated a long fracture in the crust and was exposed when the surrounding softer sedimentary beds were eroded away. I am running out of time. I retrace my route, pausing for a panorama of the west side of Comb Ridge. The ridge is capped with Jurassic Navajo Sandstone, as I mentioned earlier. 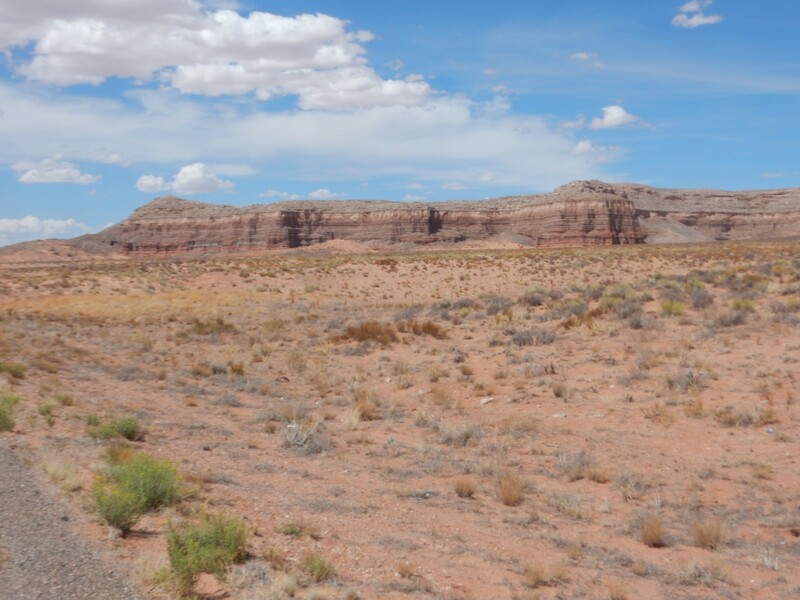 Beneath this is Kayenta Formation and Wingate Formation, both latest Triassic in age. 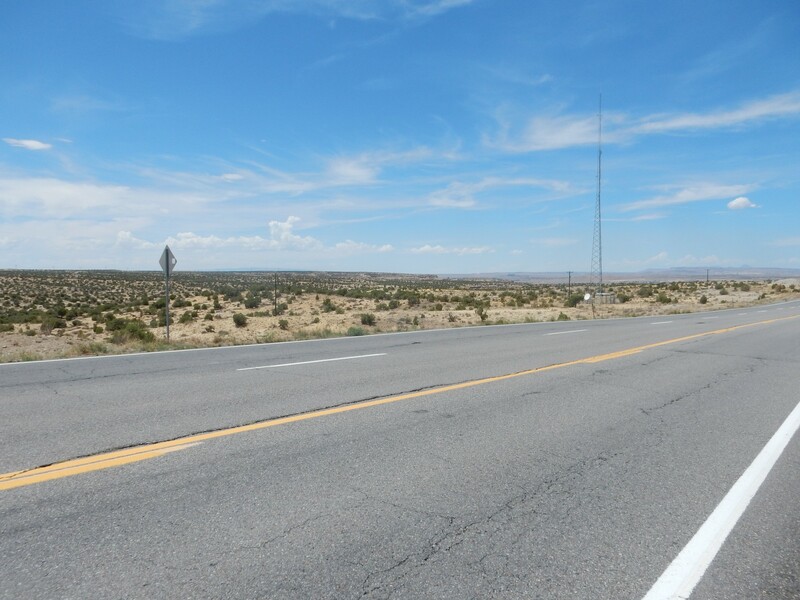 At far left on the skyline are the Abajo Mountains, where I will be camping tonight. I’m within visual range of today’s journey’s end, though it’s still a significant drive. 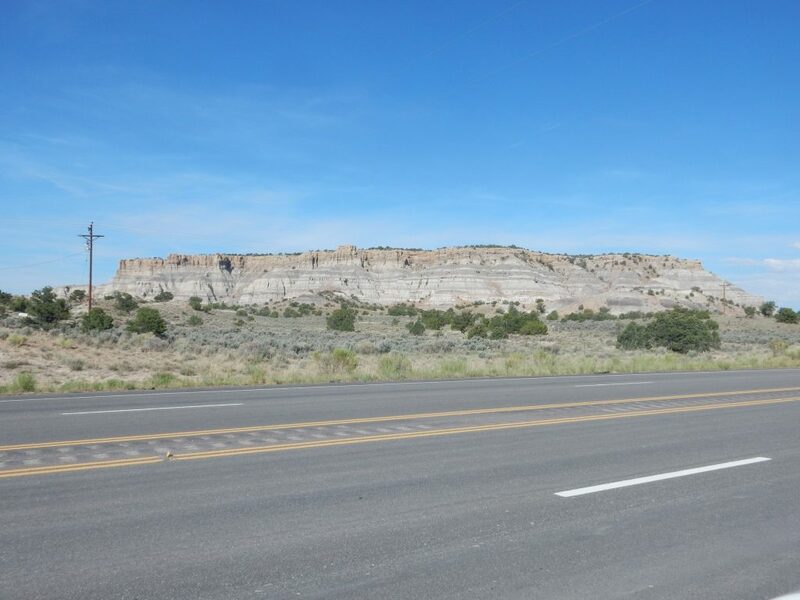 I pass through Bluff, pausing in Cow Canyon to admire the massive Bluff Sandstone of the Morrison Formation sitting atop red beds of the Summerville Formation. 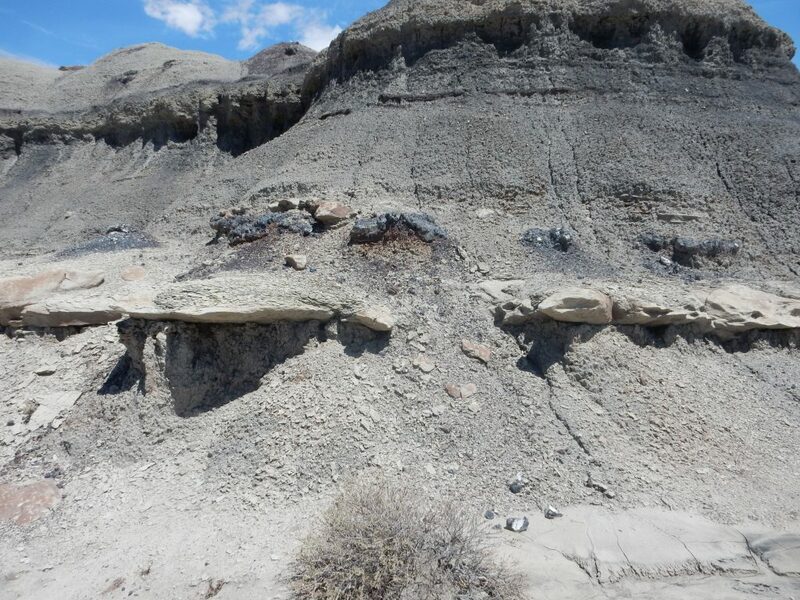 Both are Jurassic beds younger than the Navajo Sandstone. There is a magnificent road cut I just have to stop and admire, even though it’s late and I’ve looked at it before. The southern end of the cut shows a wonderful section of beds. My geologic map is vague for this area, but the red beds at the very bottom are probably Brushy Basin Member of the Morrison Formation. The greenish beds above are probably Cretaceous Burro Canyon Formation with a cap of Dakota Formation. 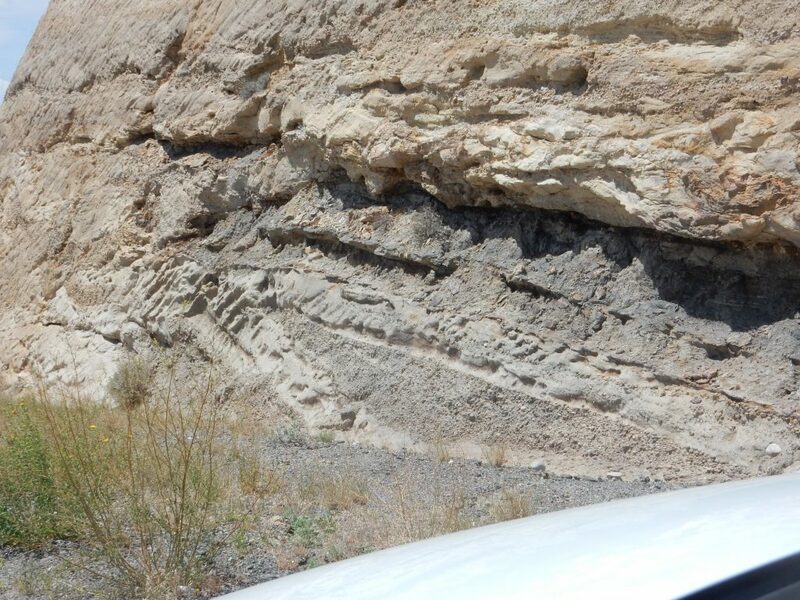 Here’s the contact between the Brushy Basin Member and the Burro Canyon Formation. and a closer look at the Burro Canyon Formation. Further north in the cut is an interesting feature. 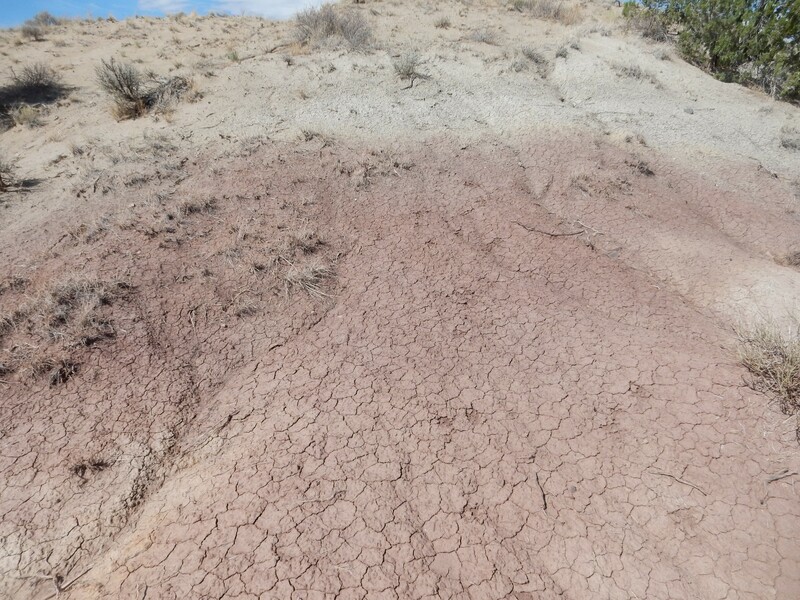 This looks like an incipient sedimentary dike, where the softer, less dense beds of the Brushy Basin Member have pushed up through the Burro Canyon Formation and into the Dakota Sandstone above. I stop in Bland long enough to refuel and eat dinner at the local steak house. It’s not terrific, but it’s pretty good, and given the local population density, probably the best place to eat within a hundred miles. 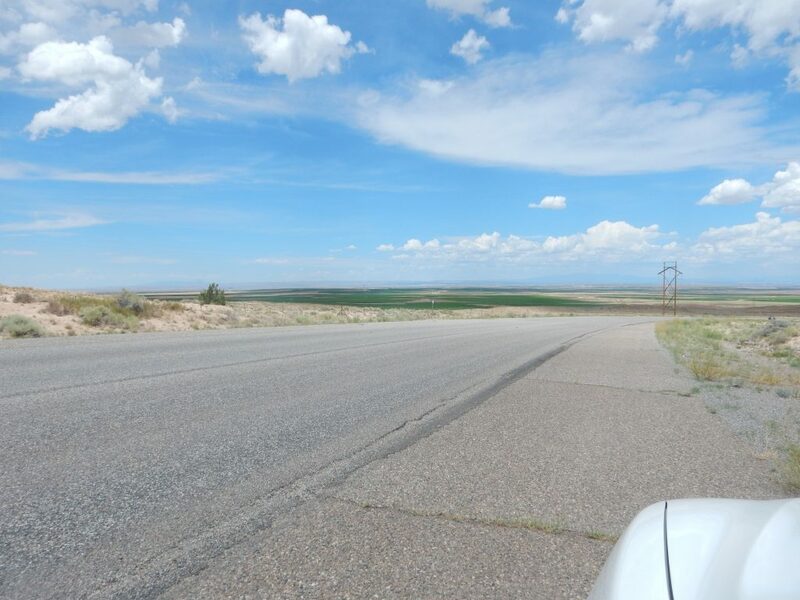 It takes a couple of tries, but I find the rural highway north that leads to my campsite, pausing for one more panorama, of Johnson Creek canyon. The canyon is rimmed with Dakota Formation, overlying colorful beds of the Brushy Basin Member. Incidentally, my road passes just east of Brushy Basin. Which, by another stunning coincidence, is underlain by Brushy Basin Member. Yes: Geologic formations are always named after geographic locations near a good exposure, which is called the type section. 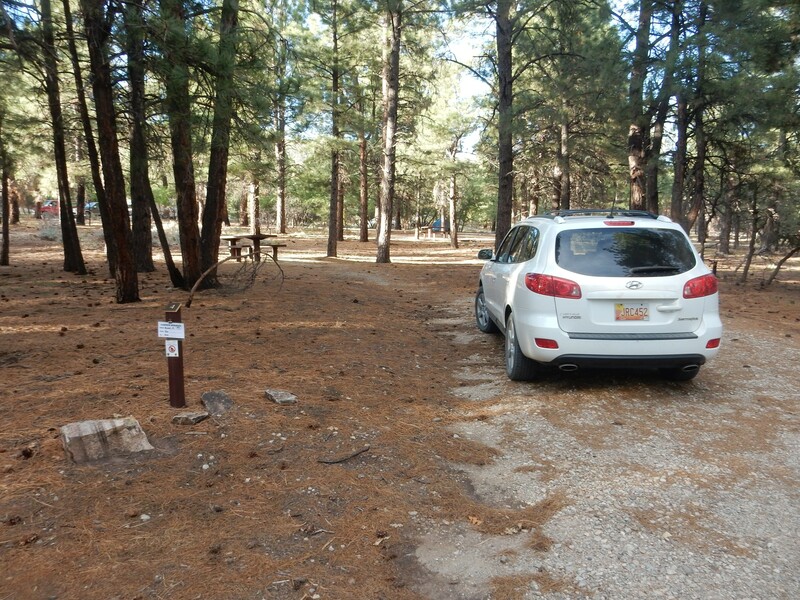 I arrive at my camp site. I small girl, perhaps six years old, waves at me. The camp is well up in the mountains, and I am glad to be out of the blast furnace lower down. I set up my tent, but I don’t feel the need to do more than the dome, to keep insects off; the rain fly remains in my bag. I pull out the cell phone to call Cindy. It has almost no charge left after only half a day on the trail. Huh. I have just enough left in the battery to say a few words to Cindy before the phone dies. I feel like I needed a touch more exercise, and find that there is a trail nearby. I realize there is not time before daylight to hike the whole trail, but figure I’ll see how far I can go. 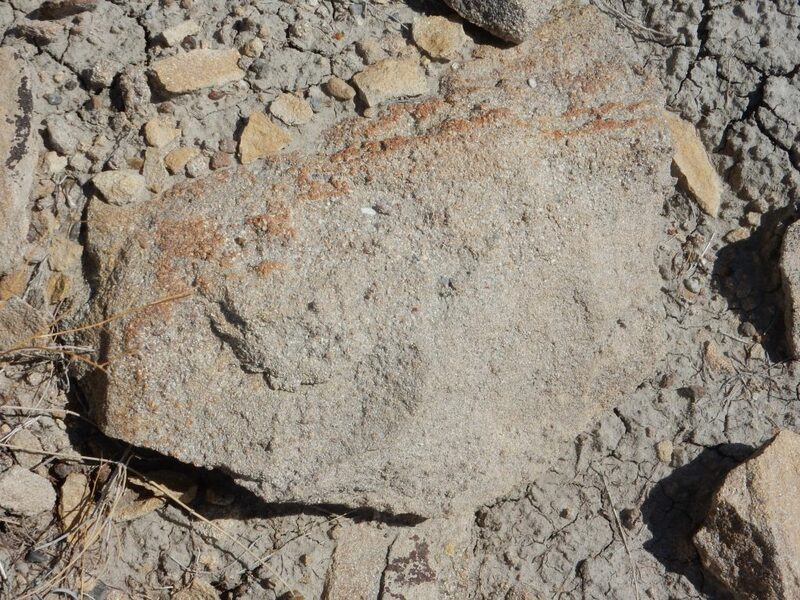 A sample of the local diorite. 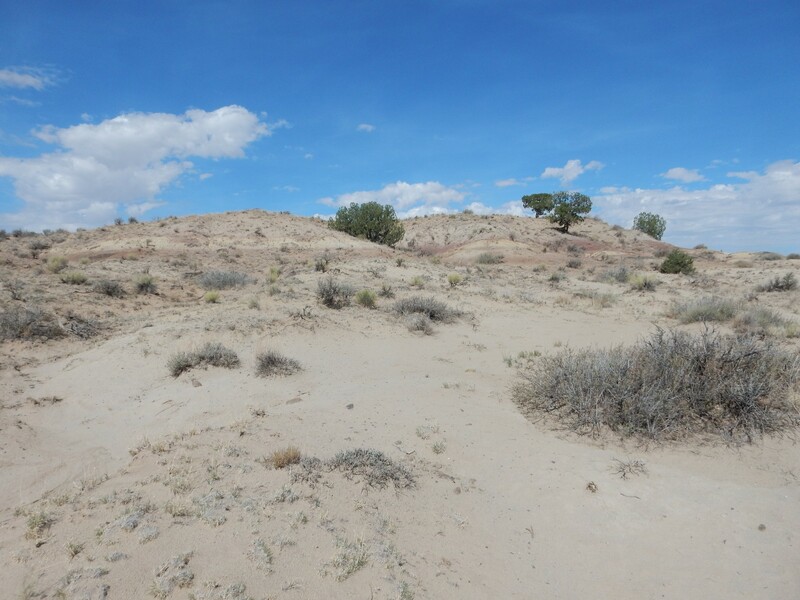 The Abajo Mountains at whose feet I am camping are laccoliths, like Beclabito Dome, but considerably larger and eroded enough to expose the solidified magma that pushed up the domes. This magma had a moderate silica content, producing a rock composed mostly of feldspar: diorite. The dark grains are a mineral called hornblende, making this a hornblende diorite. Then back to my tent. The moon is full, so I do not bother digging out my telescope. I find that I have not remembered to bring a pillow, but it is a warm night, so I simply lay on my air mattress and use my rolled-up sleeping bag as a pillow. This works farily well until I am awakened by a loud scratching sound at the door of my tent. This makes me decidedly nervous. I finally work up the nerve to look out the tent door; nothing. It turns out to be a surprisingly small beetle trapped under my tent door ground flap. ** No, really. This is the official description of a volcanic eruption with a volcanic explosivity index of 7.